ENG: When we got the inquiry of whether we wanted to test the new Jaguar E-PACE a couple of weeks ago, we didn’t really had to think about it very long. We knew immediately that we wanted to take the compact premium SUV south, and that is predestined for a road trip through Italy. When I then asked for ideas and about what areas of Italy were worth seeing, the feedback was enormous. We would have loved to drive to Rome or even Naples, but that would have been too far to do within ten days and starting in Hamburg! 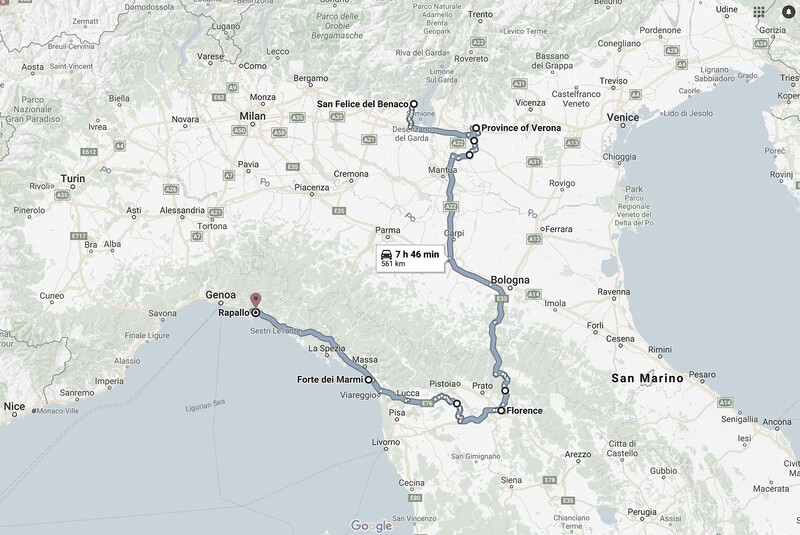 We then decided to stay at Lake Garda for a few days, to then drive to Florence via Verona. From here, we went on to Forte Dei Marmi, with a day trip to Lucca. The last stop was Rapallo in Liguria, which was the perfect spot to visit Portofino and Cinque Terre. 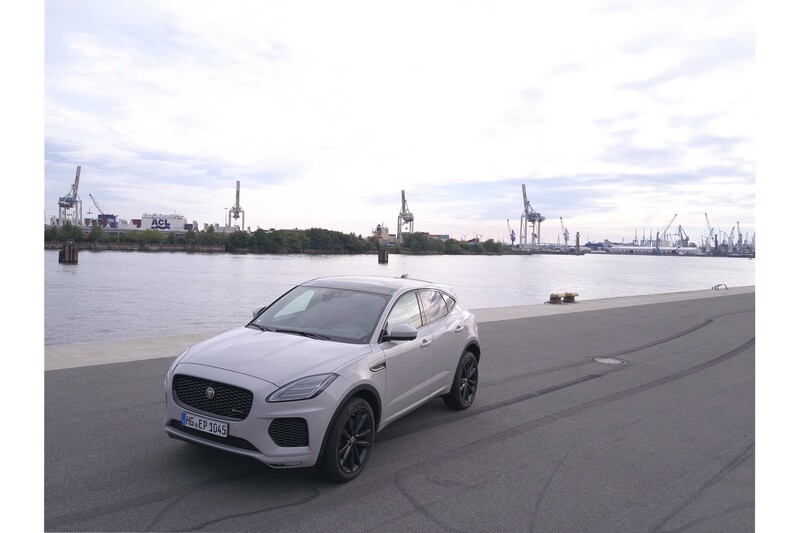 But let’s go back to the beginning: The Jaguar E-PACE is the first compact-SUV of the British Premium brand. I am generally a huge SUV fan and led by the looks of a car as a woman already. It was definitely love at first sight with the Jaguar, which is sporty and elegant at the same time, and especially the grey (‘Borasco Grey’) is an eye catcher, which we realized in Italy over and over again, too. 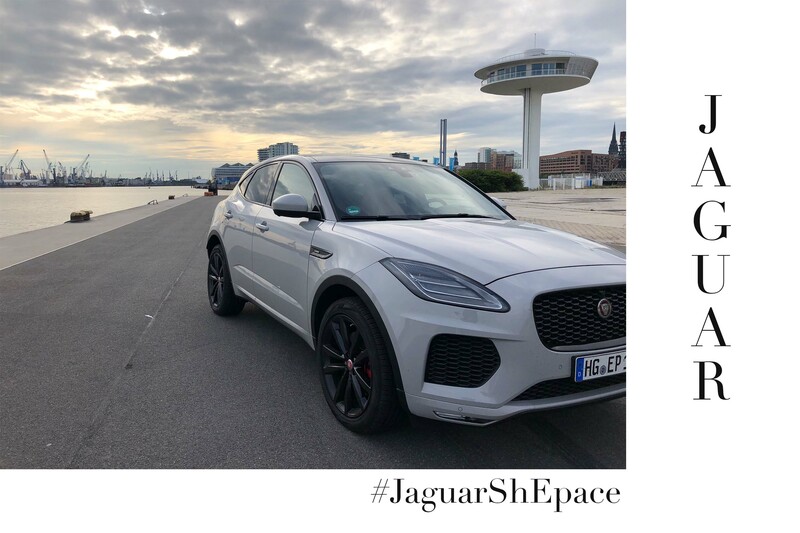 Der Jaguar E-PACE ist der erste Kompakt-SUV des britischen Premiumherstellers. Ich bin generell ein großer Fan von SUVs und als Frau schon sehr von der Optik eines Fahrzeugs getrieben. Bei dem Jaguar war es definitiv Liebe auf den ersten Blick, der Wagen ist sportlich und elegant zugleich, vor allem das Grau (‚Borasco Grey’) ist definitiv ein Hingucker, was wir auch in Italien immer wieder gemerkt haben. 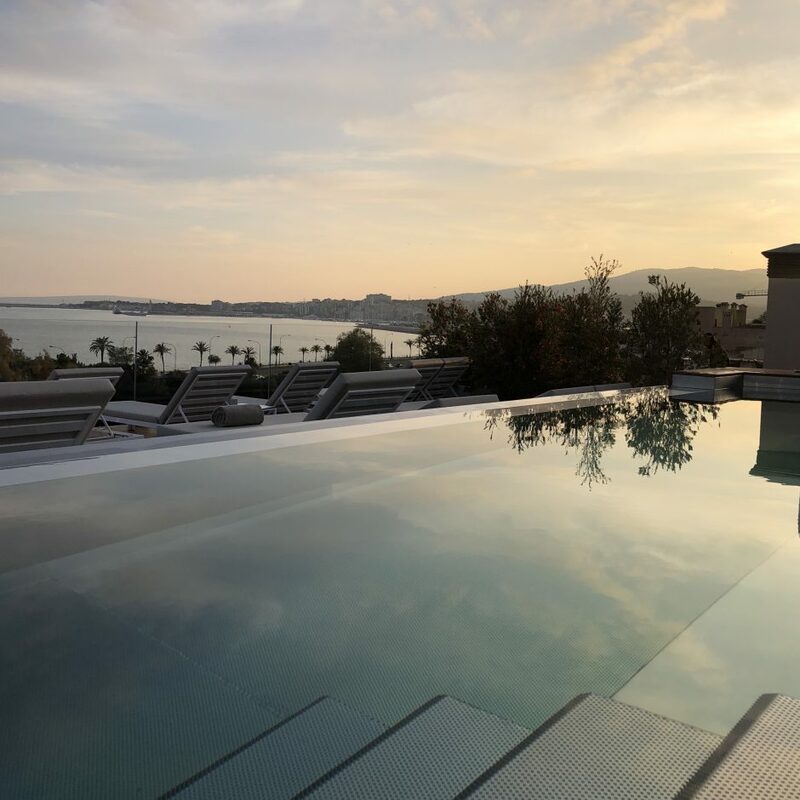 ENG: Right on time to the school holidays in southern Germany we first drove to Lake Garda. Here we slept at the ‘Hotel Ristorante Sogno’ in the small town of San Felice del Benaco. 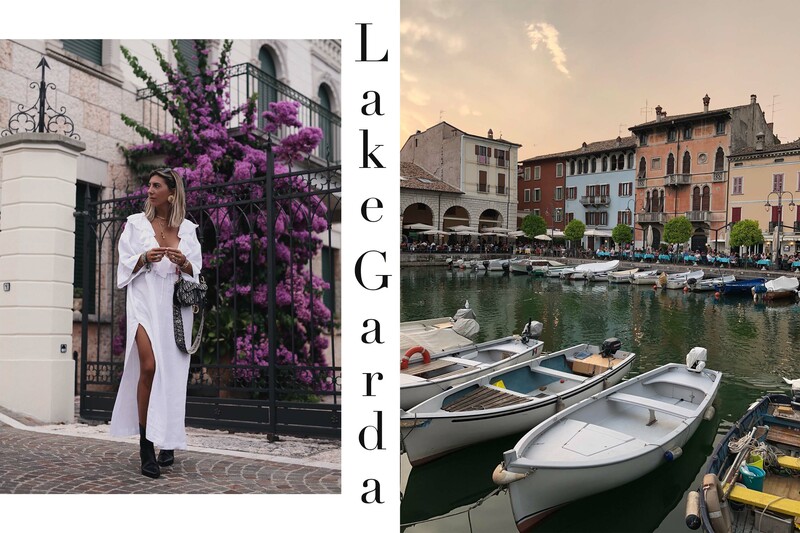 It was the first time at Lake Garda for me and I have to admit that the nature and the surrounding villages really impressed me. 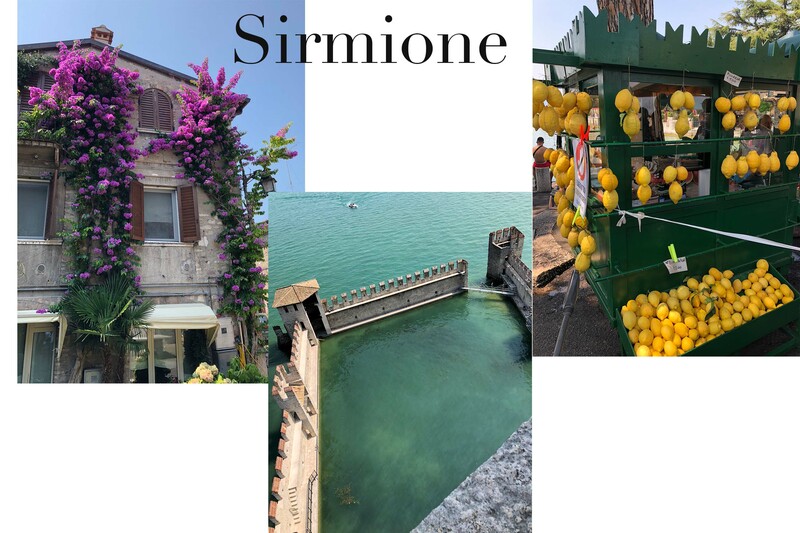 My highlight at Lake Garda definitely was the town Sirmione at the southern shore of the see. The historic town center is located on the peninsula, which reaches into the lake. Beautiful scenery with many small streets, local shops, and of course the direct access to the lake. Something negative about the lake that stuck with us were the few areas where you could sunbathe and the fact that it felt like German was spoken much more than Italian. 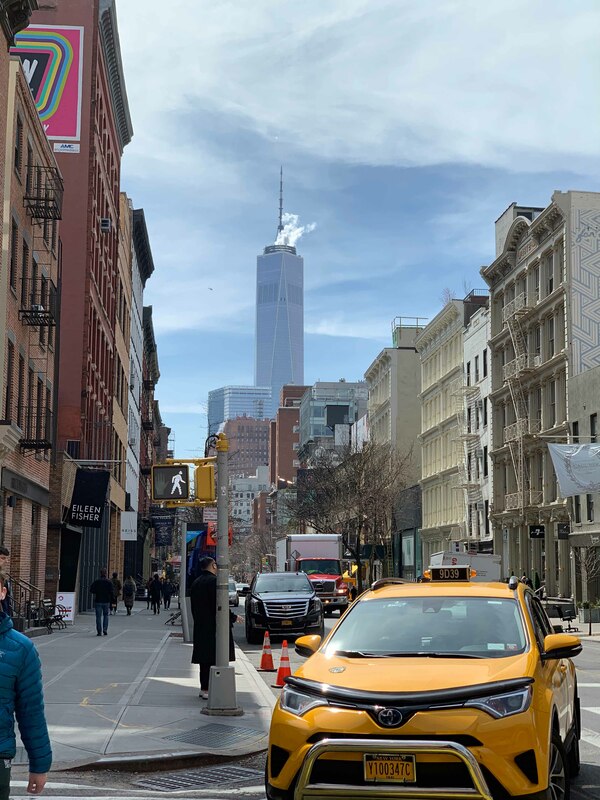 To me it mostly feels like a holiday if I am surrounded by locals and have to adjust to the circumstances and mentality of the people, and not the other way around. DE: Pünktlich zum Start der Schulferien in Süddeutschland ging es also zunächst an den Gardasee. Hier haben wir im ‚Hotel Ristorante Sogno’ in dem kleinen Örtchen San Felice del Benaco geschlafen. Ich war das erste Mal am Gardasee und muss zugeben, dass mich die Landschaft und umliegenden Dörfer sehr beeindruckt haben. Mein Highlight am Gardasee war definitiv die Ortschaft Sirmione am Südufer des Gardasees. Das historische Zentrum liegt auf einer Halbinsel, die in den See hineinragt. Eine wunderschöne Kulisse mit vielen kleinen Gassen, lokalen Geschäften und natürlich direkten Zugängen zum See. Was vom Gardasee negativ in Erinnerung bleibt, sind die wenigen Abschnitte am Wasser zum Sonnen und die Tatsache, dass gefühlt mehr Deutsch, als Italienisch gesprochen wird. Für mich kommt immer erst dann ein richtiges Urlaubsfeeling auf, wenn ich mich zwischen Einheimischen bewege und mich den Gegebenheiten bzw. der Mentalität der Menschen anpassen muss, nicht umgekehrt. 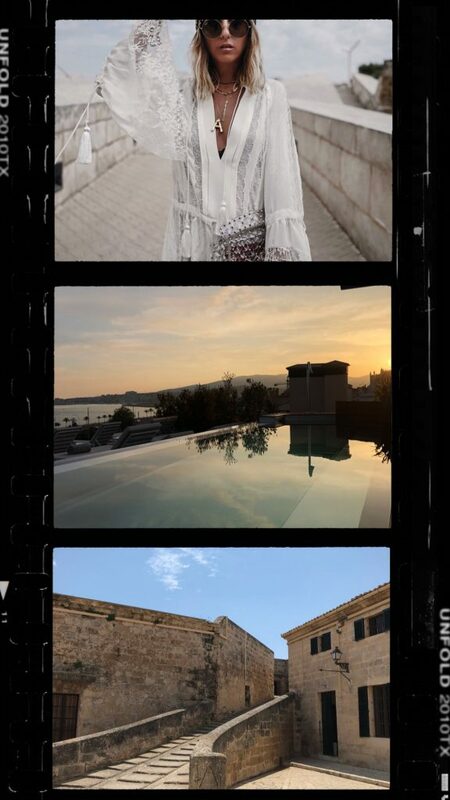 ENG: This feeling really only remained for the three days at Lake Garda, and I felt the true vacation-spirit for the first time at our stop in Verona. Even if we’ve only really spent a couple of hours in Verona, the middle-aged city is especially impressive. The total tourist hotspot is the small balcony of a city residential building, which is the venue of Shakespeare’s ‘Romeo and Juliet’. In addition to that the arena of Verona is really impressive, and it was only last year that I was able to see the arena from the insight in line with a client’s project, but it is just as much of a highlight and memorable part of the town from the outside, too. 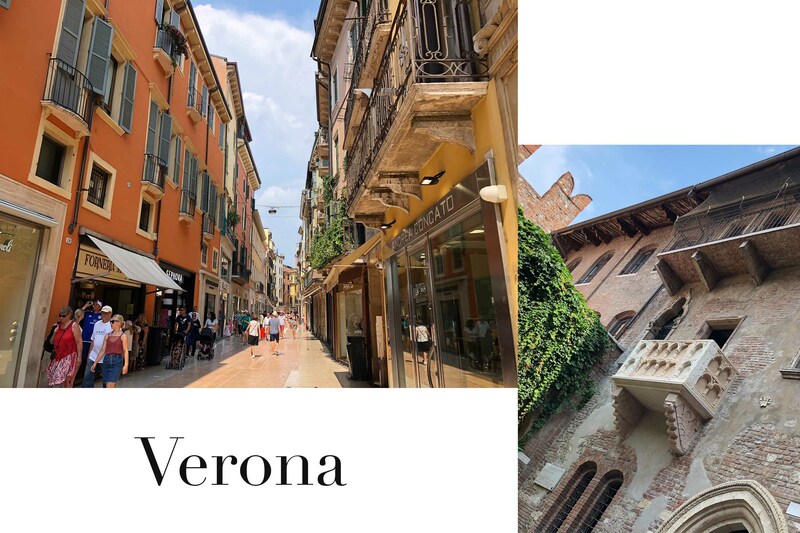 We had gotten a little taste of the Italian city heat in Verona, which was going to be even stronger for our next stop. DE: Dieses Gefühl hatte ich allerdings nur während der drei Tage am Gardasee, bei unserem Zwischenstopp in Verona habe ich das erste Mal richtiges Urlaubsfeeling gespürt. Auch wenn wir nur ein paar Stunden in Verona verbracht haben, ist vor allem die mittelalterliche Altstadt besonders imposant. Der absolute Tourismusmagnet ist der kleine Balkon eines städtischen Wohnhauses, bei dem es sich um den Schauplatz von Shakespeares ‚Romeo und Julia’ handelt. Zudem ist die Arena von Verona sehr beeindruckend, letztes Jahr durfte ich mir im Rahmen eines Kundenprojektes die Arena von innen anschauen, auch von außen ist das römische Amphitheater definitiv das Wahrzeichen der Stadt. Wir hatten in Verona schon einen Vorgeschmack auf die städtische Hitze in Italien bekommen, was beim nächsten Halt allerdings noch deutlich verstärkt werden sollte. ENG: From Verona we then drove about two hours. Even if the Italian highways impose a speed limit of 120km/h, the comfort of driving was incredibly high with the Jaguar E-PACE. The car has a 4G Wifi Hotspot to connect up to eight external devices, which meant that I was able to connect with the car and work from the road, and there is even a connector for micro SD sim-cards to view photos, too. In Florence itself we were only on tour on foot of course, and had decided to go for the boutique hotel ‘Palazzo Castri 1874’, which was only a couple of minutes walking distance to the city center. To be honest, we were a little inhibited of coming to Florence, since many of you had told me not to go on a city trip here in August, and we should have listened. The glowing heat and zero wind we then went on our way to the city center of the capital of Tuscany, and especially the bridge ‘Ponte Vecchio’ was very impressive to us. The bridge holds small hanging bridge shops, which implies the image as seen from the shore that ‘Ponte Vecchio’ is a small, over the water-hanging city. Florence has lots to offer in terms of culture, history and even fashion, as many known designers have their production sites within the city of close by, which is why we had to take a little trip to ‘The Mall’ after our two day trip, too, which is a designer outlet about 30 minutes outside of the city. 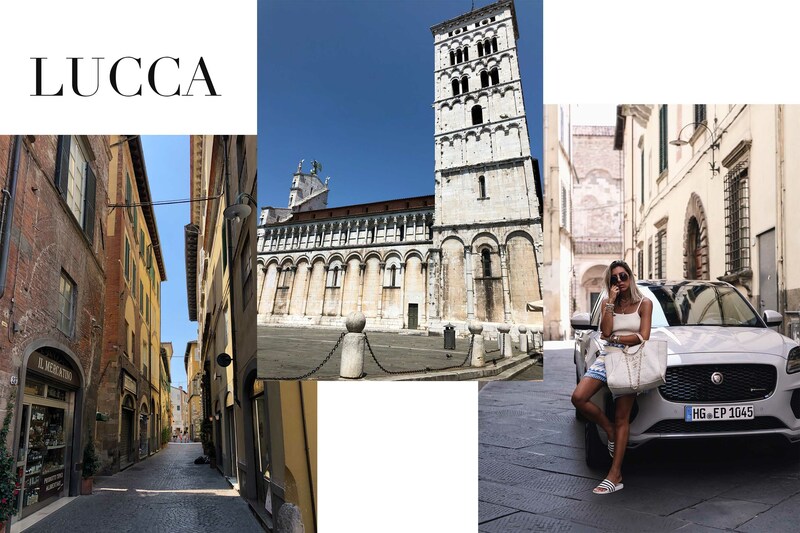 All Italian designers have become residents here and offer reductions of up to 80%, which makes it a true shopping paradise in the heart of Tuscany, that you shouldn’t miss during your next visit. DE: Von Verona bis Florenz sind wir ca. zwei Stunden gefahren. Auch wenn auf italienischen Autobahnen ein generelles Tempolimit von 120km/h gilt, war der Fahrkomfort mit unserem Jaguar E-PACE einfach unglaublich hoch. Der Wagen hat einen 4G Wi-Fi Hotspot für die Vernetzung von bis zu acht externen Geräten, ich konnte mich also stets mit dem Auto verbinden und von unterwegs arbeiten, es gibt sogar einen Anschluss für Micro SD-Karten zum Abspielen von Bildern. In Florenz selbst waren wir natürlich nur zu Fuß unterwegs und hatten uns für das Boutique Hotel ‚Palazzo Castri 1874’ entschieden, das nur wenige Gehminuten vom Zentrum entfernt liegt. 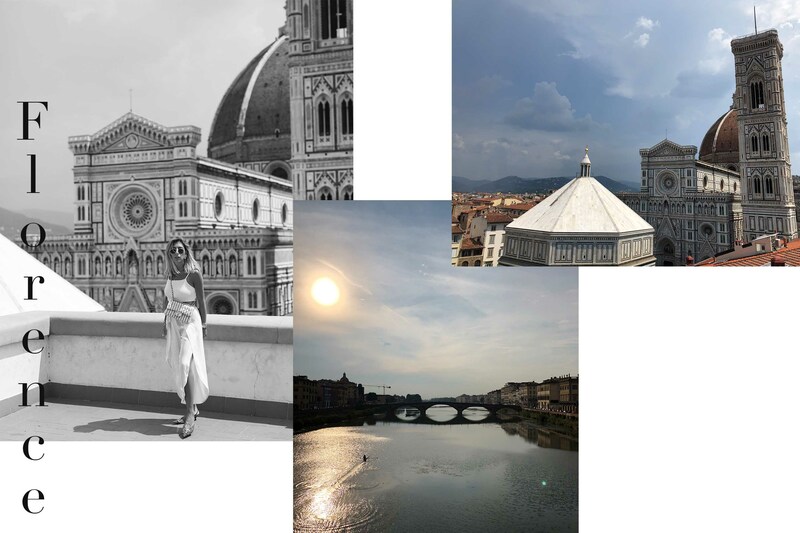 Um ehrlich zu sein, hatten wir ein bisschen Respekt vor Florenz, da mir doch einige über Instagram von einem Städtebesuch im August abgeraten hatten und genauso kam es dann auch. Bei glühender Hitze und stehender Luft haben wir uns auf den Weg ins Zentrum der toskanischen Hauptstadt gemacht, vor allem die Brücke ‚Ponte Vecchio’ hat uns besonders beeindruckt. Auf der Brücke befinden sich kleine überhängende Brückenläden, sodass vom Ufer aus betrachtet der Eindruck entsteht die ‚Ponte Vecchio’ wäre eine winzige, über dem Wasser hängende Stadt. Florenz hat in Bezug auf Kultur, Geschichte aber auch Mode einiges zu bieten, viele bekannte Designer haben in oder in der Nähe von Florenz ihre Produktionsstätten, sodass wir nach unserem zweitägigen Aufenthalt definitiv noch einen Abstecher in der ‚The Mall’ machten mussten, ein Designer-Outlet, das ca. 30 Autominuten entfernt von Florenz liegt. Alle italienischen Designer haben sich hier niedergelassen und bieten Preisreduzierungen von bis zu 80% an, ein wahres Shopping-Paradies im Herzen der Toskana, das ihr euch bei eurem nächsten Besuch nicht entgehen lassen solltet. ENG: From Florence we then went on to drive another hour and a half, to make our first stop by the Italian coast. 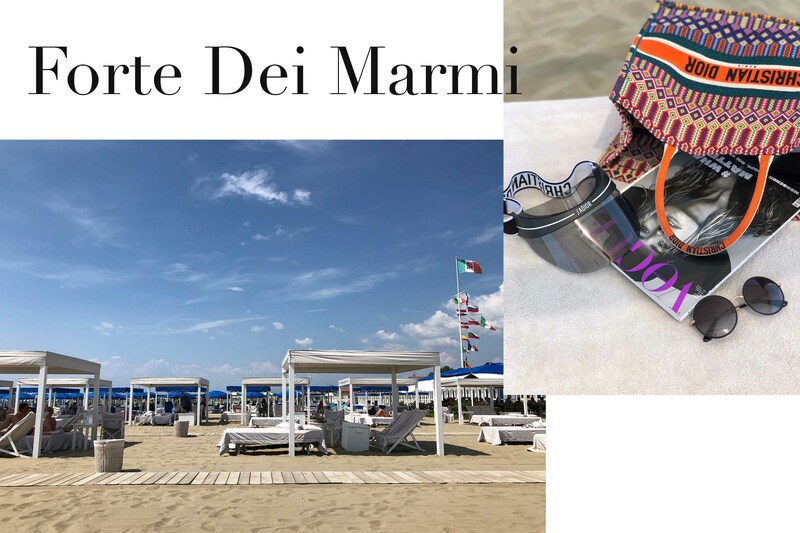 We stayed in Forte Dei Marmi for three nights, which is a small community in the Province of Lucca by the Ligurian Ocean. Many Italy experts had recommended this place to us, because Italians mainly use it as a vacation spot, and only few international tourists make their way here. Our hotel, the ‘Il Negresco’ offered an incredibly beautiful view of the beach and was only a few minutes away of the center of the small community. 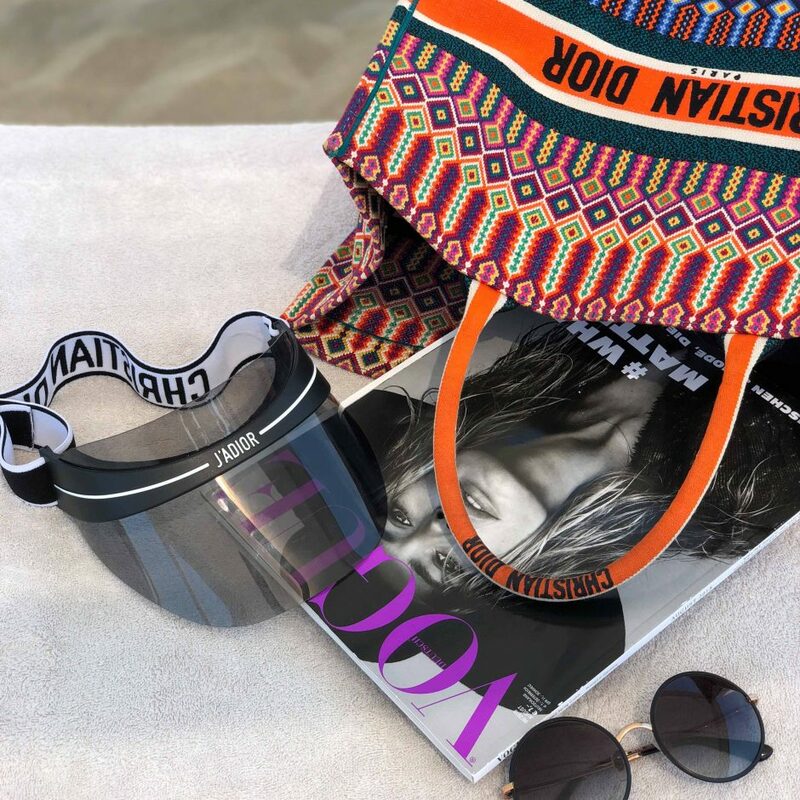 In Forte Dei Marmi the principle of ‘seeing and being seen’ is relevant, which is why many wealthy Italians make their way through the city center during the evening hours, where designers such as Gucci and Louis Vuitton are located, too. Lucca, which is both the name for the capital of the Province as well for the Provence itself, is a beautiful spot too. It is known to be one of the most beautiful towns in Tuscany, with a very well preserved city wall from the Renaissance era, as well as a city center of the middle ages and many, many towers. Even though we were shown 40°C in the sun, Lucca was really impressive and easy to get to by car. DE: Von Florenz sind wir weitere eineinhalb Stunden gefahren, um das erste Mal Halt an der italienischen Küste zu machen. Wir sind drei Nächte in Forte Dei Marmi geblieben, eine kleine Gemeinde der Provinz Lucca am Ligurischen Meer. Uns hatten vor dem Roadtrip einige Italien Experten diese Ortschaft empfohlen, da sie besonders von Italienern selbst als Urlaubsort genutzt wird und hier weniger internationale Touristen sind. Unser Hotel, das ‚Il Negresco’ bot einen unglaublich schönen Blick auf die Strandpromenade und war nur wenige Minuten vom Zentrum der kleinen Gemeinde entfernt. In Forte Dei Marmi gilt schon das Prinzip ‚Sehen und gesehen werden’, in den Abendstunden tummeln sich viele wohl betuchte Italiener im Zentrum, in dem Designer, wie Gucci und Louis Vuitton natürlich nicht fehlen dürfen. Die gleichnamige Hauptstadt der Provinz Lucca ist ebenfalls ein wunderschönes Ausflugsziel. Lucca gilt als einer der schönsten Orte in der Toskana mit einer gut erhaltenen Stadtmauer aus der Renaissance sowie dem mittelalterlichen Stadtkern und den zahlreichen Türmen. Auch wenn bei unserem Besuch 40° in der Sonne angezeigt wurden, hat uns Lucca sehr beeindruckt und ist mit dem Auto problemlos zu erreichen. 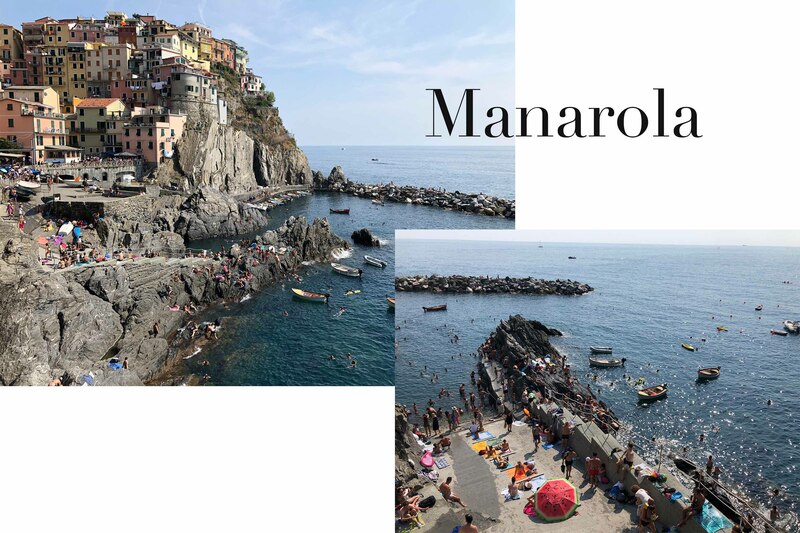 ENG: Our last stop of the 10-day trip was Rapallo, which is a city within the region of Liguria just North of Tuscany. Originally we had planned to stay in Portofino, but the small fishing village is so small that there were no available rooms anymore. We then decided to spend the last nights in Rapallo, at the ‘Best Western Tigullio Royal’ to be precise, and to visit Portofino and Cinque Terre from here instead. 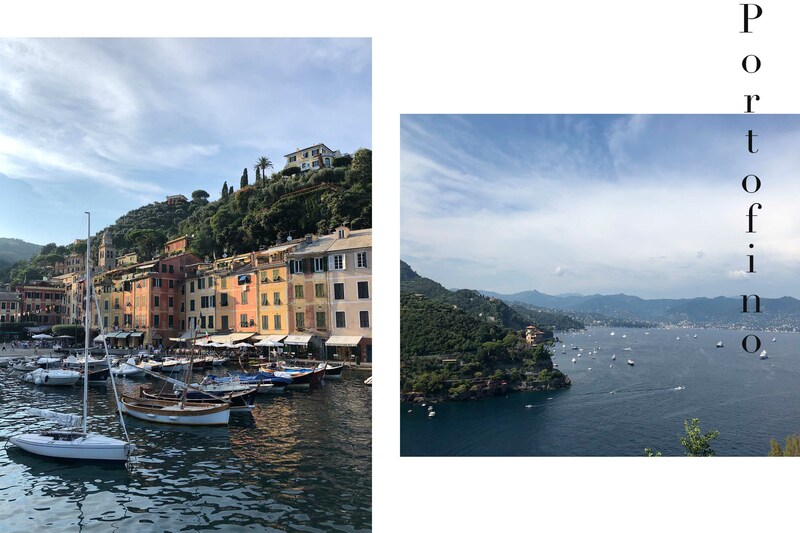 We took the ferry to Portofino right on the first day, which goes along the coast and offers a dreamy panoramic view. For the both of us Portofino was the absolute highlight of the trip. Pastel-colored houses, boutiques, luxury yachts and restaurants really dominate the image of the small town, which is located within a dreamy bay. The probably most beautiful view is right from the castle close by, the Castello Brown, from which you have an unbelievable panoramic view of the town and the Ligurian Ocean. We took the ferry again on the last day of our trip to see the five Oceanside towns and the neighboring community of Cinque Terre. The towns are mostly known for the colorful houses and vineyards, the few from the water in the particular town has the potential to be printed on a postcard. 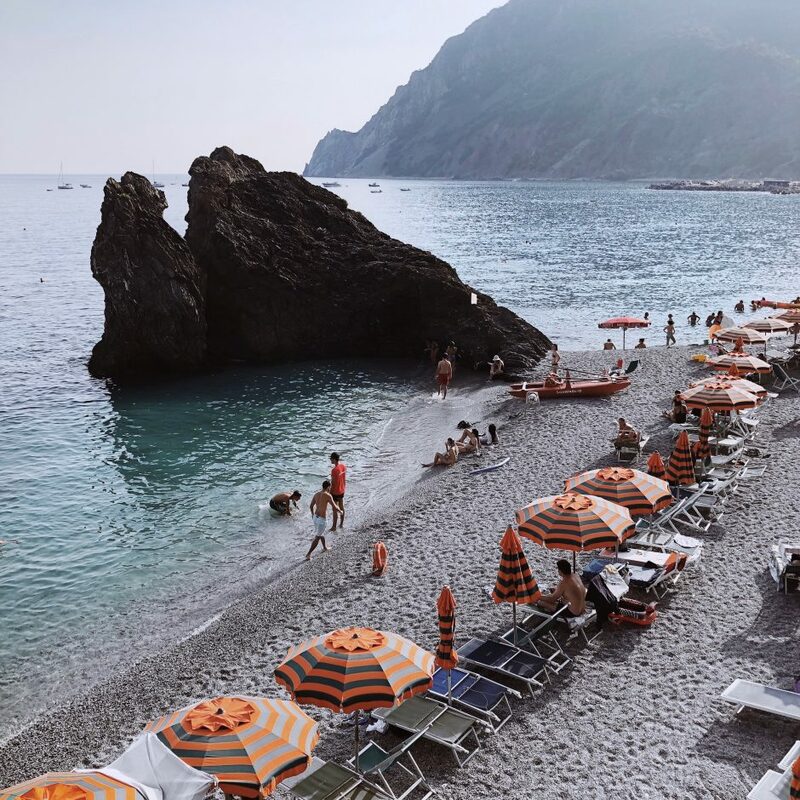 Unfortunately, Cinque Terre is visited frequently by tourists in August, which is why our excitement for the town was rather limited. DE: Unser letzter Stopp der zehntägigen Reise war Rapallo, eine Stadt in der Region Ligurien oberhalb der Toskana. Ursprünglich sollte unser letzter Aufenthalt in Portofino stattfinden, allerdings ist dieses Fischerdorf derart klein, dass es einfach keine freien Zimmer mehr gab. Wir entschieden uns daher die letzten Nächte in Rapallo zu verbringen, genauer gesagt im ‚Best Western Tigullio Royal’ um von hier aus Portofino und Cinque Terre zu besichtigen. Wir sind gleich am ersten Tag mit der Fähre nach Portofino gefahren, die entlang der Küste einen traumhaften Panoramablick bietet. Für uns beide war Portofino das absolute Highlight der Reise. Pastellfarbene Häuser, Boutiquen, Luxusboote und Restaurants prägen das Bild dieses kleinen Ortes, der in einer traumhaften Bucht liegt. Den wohl schönsten Blick gibt es auf der nahegelegenen Festung, dem Castello Brown, von hier habt ihr einen unglaublichen Panoramablick auf den Ort und das Ligurische Meer. Am letzten Tag unserer Reise waren wir wieder mit der Fähre unterwegs, um die fünf Küstendörfer bzw. Nachbargemeinden von Cinque Terre zu besichtigen. Die Dörfer sind vor allem für ihre bunten Häuser und die Weinberge an den Steilhängen bekannt, der Blick vom Wasser in das jeweilige Dorf hat immer Postkartenpotenzial. Leider wird Cinque Terre im August sehr stark von Touristen besucht, sodass sich unsere Begeisterung eher zurückhielt. DE: Nach 10 Tagen ging es dann über Italien, die Schweiz, Liechtenstein und Österreich zurück nach Deutschland. Es war ein Genuss in Deutschland nochmal die 300 PS vom E-PACE auszukosten und im Dynamic Modus auch nach 10 Stunden noch Spaß beim Fahren zu haben. ENG: As you have maybe recognized, I’m staying in Italy since the beginning of the week for undertaking a road trip and our previous impressions are great so far. We’ve started the trip at Lake Garda, via Sirmione, Verona and Florence we made it to Forte Dei Marmi, a resort being very famous for Italians themselves. 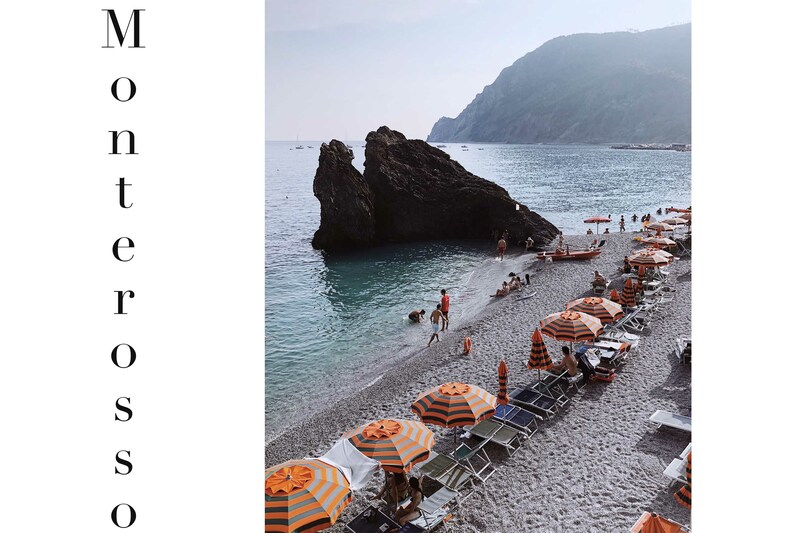 From tomorrow on we will go on to Cinque Terre and Portofino as the last stations of our Italy journey. As soon as we will be back in Germany, I write a separate and detailed blog post about our road trip with the single destinations, hotels and our personal highlights. Via Instagram Stories I’m regularly getting such lovely messages about the origin of my clothes and if I can share more information on this topic. 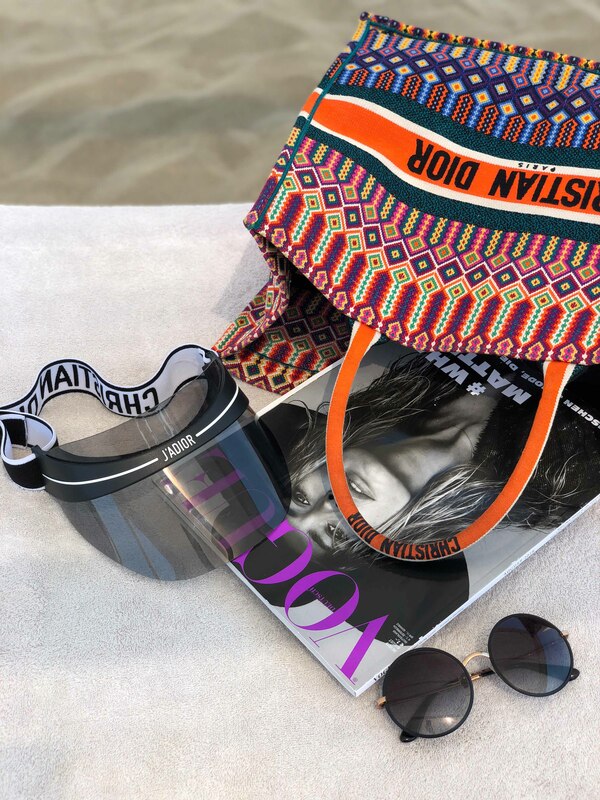 Due to this I would now like to give you some insights in my current suitcase and the most relevant pieces for these hot days here in Italy. Everything in line with the actual road trip and our impressions from the single stations, will be relevant as soon as we are back in Germany. In this sense: See you soon und happy Sunday! DE: Wie ihr vielleicht mitbekommen habt, befinde ich mich aktuell auf einem Roadtrip in Italien und die bisherigen Eindrücke sind einfach fantastisch. Zunächst waren wir am Gardasee und sind dann über Sirmione, Verona und Florenz in Forte Dei Mami gelandet, ein Urlaubsort in der Toskana, der vor allem bei Italienern sehr beliebt ist. Ab morgen gehts dann weiter Richtung Rapallo, um von hier Cinque Terre und Portofino zu besichtigen. Sobald wir wieder in Deutschland sind, werde ich nochmal einen separaten Beitrag über unseren Roadtrip mit den einzelnen Stationen, Hotels und unseren Highlights der Reise veröffentlichen. Über Instagram Stories bekomme ich regelmäßig so liebe Nachrichten von euch, woher ich meine Kleidungsstücke habe und ob ich nicht mehr Infos dazu mit euch teilen kann. Aus diesem Grund möchte ich euch heute einen Einblick in meinen Koffer gewähren, welche Kleidungsstücke hier in Italien nicht fehlen durften. Alles was die Reiseroute und unsere Eindrücke von den einzelnen Stationen selbst betrifft, werde ich euch nach der Reise näher vorstellen. In diesem Sinne: Habt alle einen schönen Sonntag! 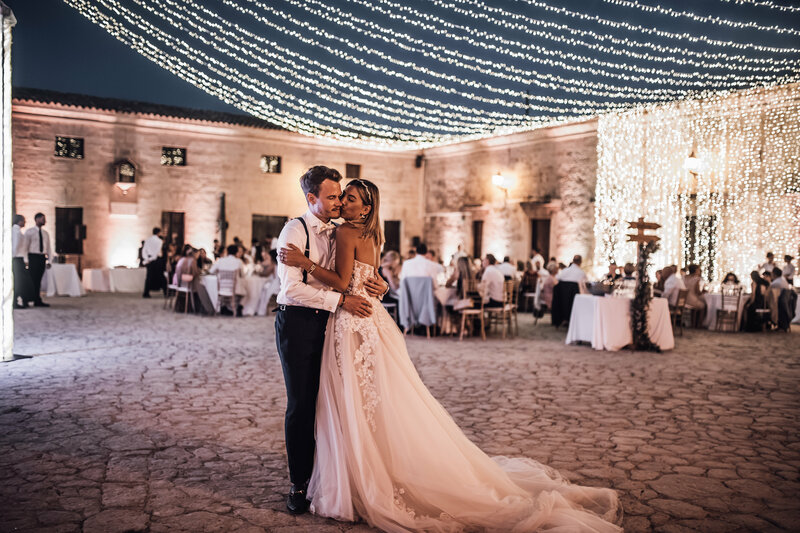 E: Since we had a lot of questions regarding our wedding lately, I wanted to give you an overview of all partners we had in Mallorca in this post. 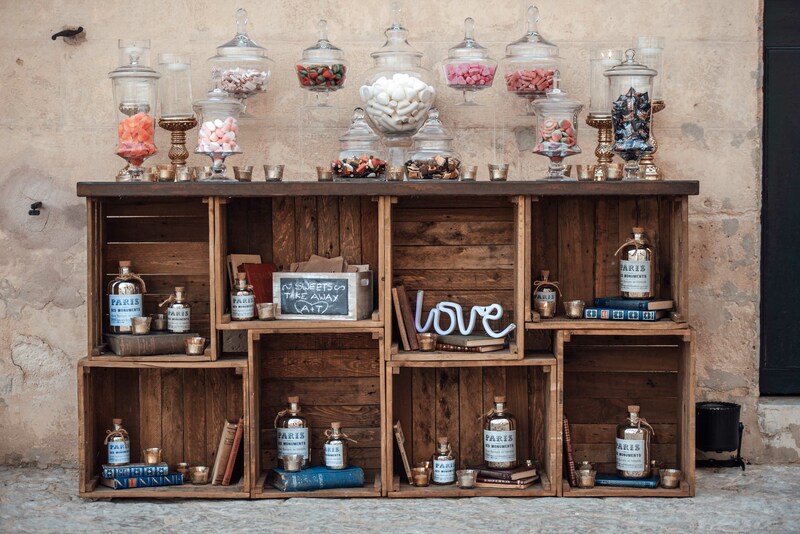 As you can probably imagine, the planning of a wedding in Spain is pretty detailed and extensive, which is why time to organize is essential. 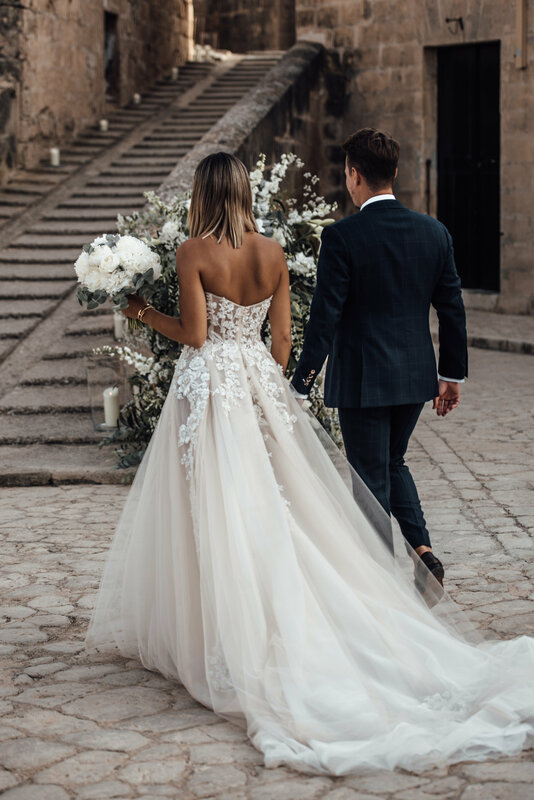 My recommendation at this point: Invest the money in a wedding planner, who is at the location all the time, speaks the language and knows all the details and partners. DE: Da in letzter Zeit vermehrt Fragen zu unserer Hochzeit auf Mallorca aufkamen, möchte ich euch heute mit diesem Beitrag eine kleinen Überblick unserer wichtigsten Dienstleister geben. 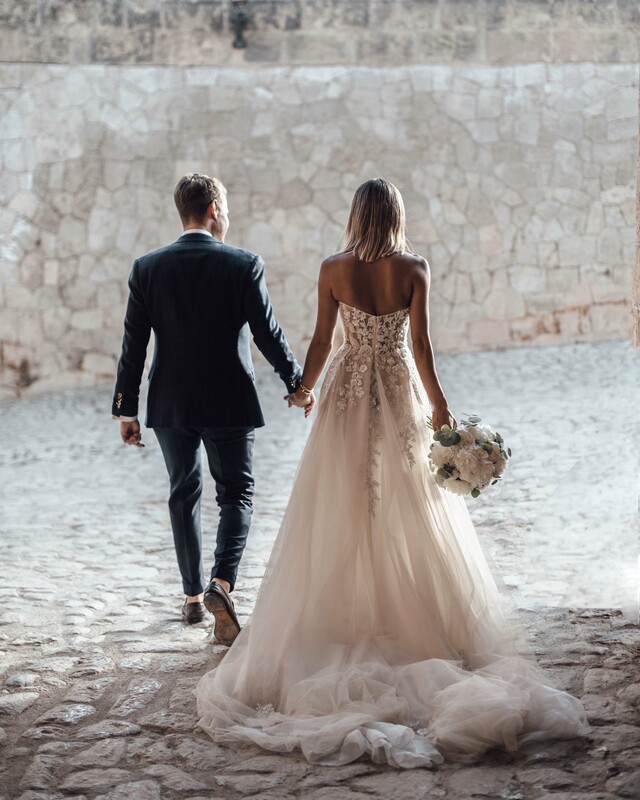 Wie ihr euch sicherlich vorstellen könnt, ist die Planung einer Hochzeit in Spanien relativ aufwendig und kleinteilig, daher bedarf es auf jeden Fall einiges an Vorlaufzeit und Organisation. Mein Tipp an dieser Stelle: Investiert das Geld in einen Hochzeitsplaner, der rund um die Uhr vor Ort ist, die Sprache spricht und vor allem mit Gegebenheiten und Dienstleistern vertraut ist. ENG: Karin and Georg recommended dear Katja to us about a year ago and we are still so happy to have had her by our side. Without her, the wedding would not have been even close to being possible the way it was. We looked at numerous locations last June, drove across the island together and were so happy with her positive energy every single time. 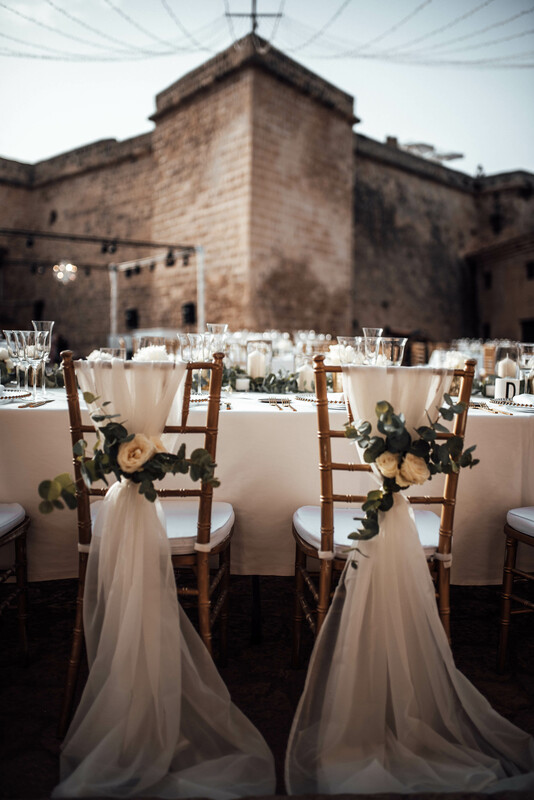 Overall we met four times in Mallorca during the course of the organization, went to the decoration service company together, the location of the pre-event, the trial dinners at the caterer. The day of the wedding she and her assistant really did an amazing job, and we are so thankful for it from the bottom of our hearts. 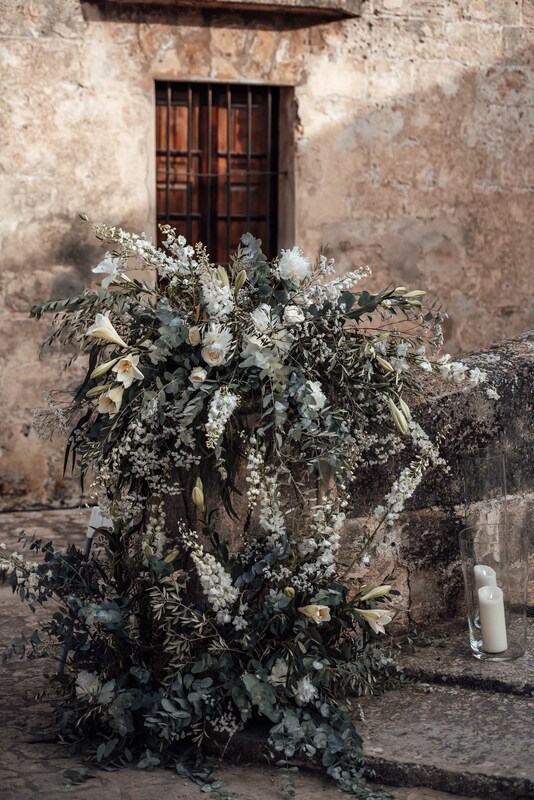 DE: Karin und Georg haben uns vor gut einem Jahr die liebe Katja von Mallorca Boutique Weddings empfohlen und noch immer sind wir so glücklich und dankbar Katja an unserer Seite gehabt zu haben. Ohne sie wäre die Hochzeit nicht mal ansatzweise in dieser Form möglich gewesen. Wir haben uns im Juni letzten Jahres unzählige Locations angeschaut, sind gemeinsam über die gesamte Insel gefahren und haben uns jedes Mal von ihrer positiven Energie anstecken lassen. Insgesamt vier Mal haben wir uns in der Vorbereitungszeit auf Mallorca getroffen, sind gemeinsam zur Dekorationsfirma, zur Location vom Pre-Event oder auch zum Probeessen beim Catering gefahren. Am Tag der Hochzeit hat sie dann gemeinsam mit ihrer Assistentin einen überragenden Job gemacht, wofür wir ihr von Herzen dankbar sind. 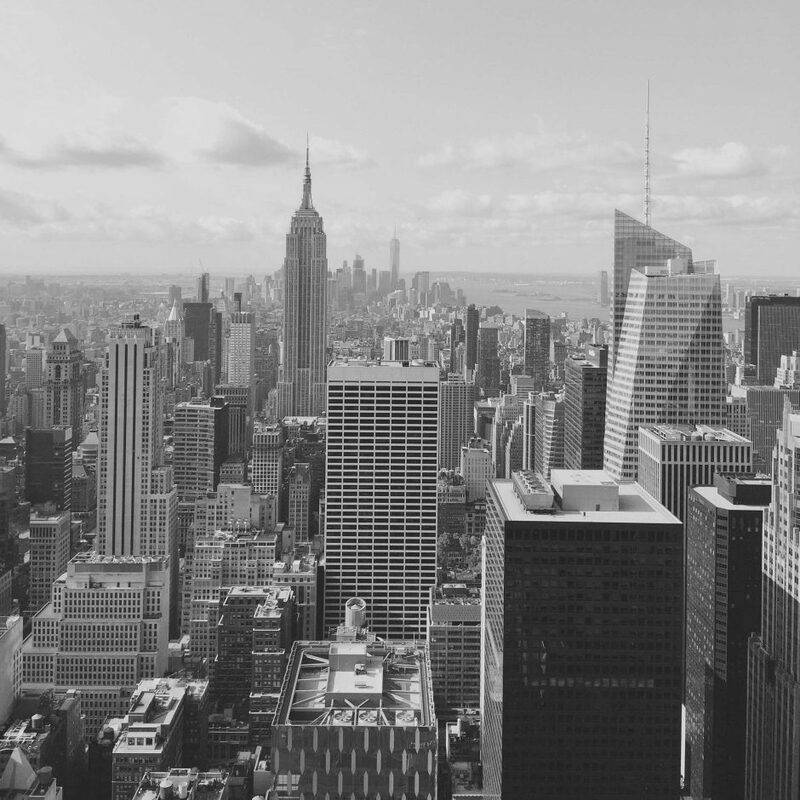 ENG: So many questions regarding our wedding locations got to us, which we don’t want to keep from you. The location is right next to the harbour of Palma. 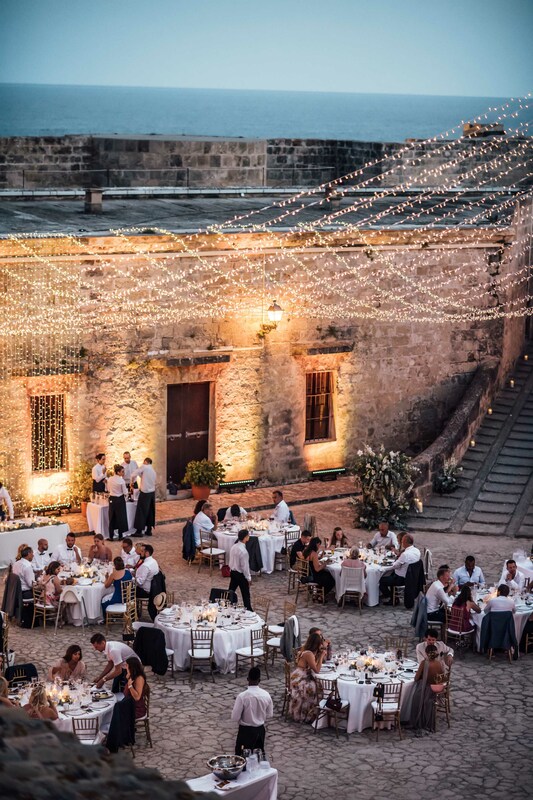 We looked at so many incredible places on the island, but had specific ideas and notions in mind from the start: the ceremony should have an ocean view, the wedding itself should be in one place, and the most important thing: being able to celebrate as long and as loud as we wanted to, right under the stars. Unfortunately there is now a law in place in Mallorca that parties have to be taken inside after midnight. 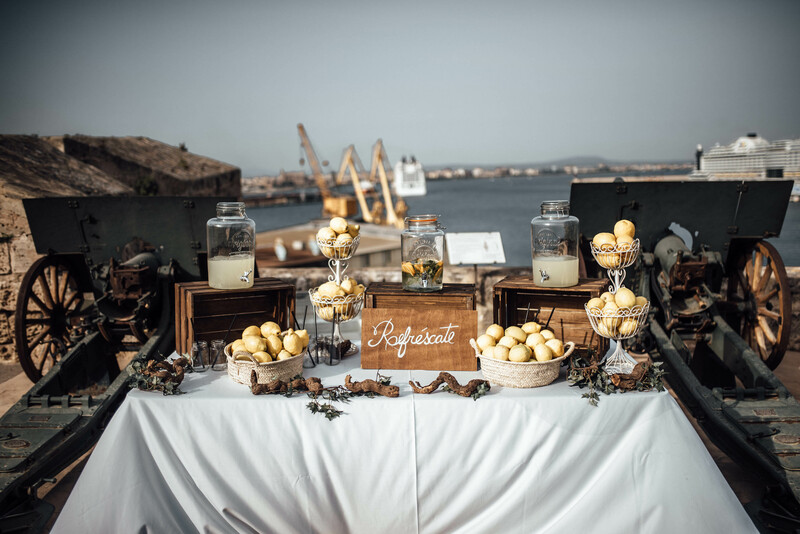 Our location, the Castillo de San Carlos, which is actually a military museum, does not have immediate neighbours and is therefore perfect for any wedding party. 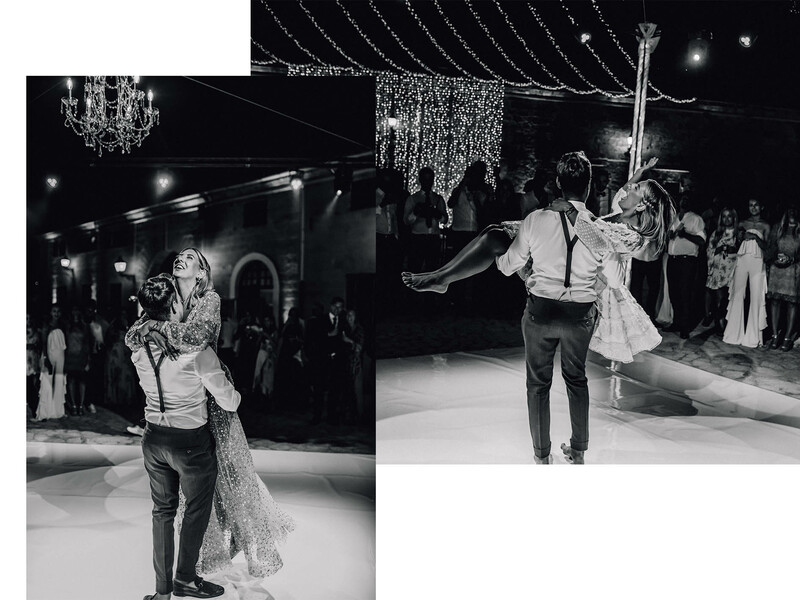 It is still important to mention that the process is relatively complicated and long, since the place is kind of ‘naked’ and has to be provided with everything: chairs, tables, decoration, lights, dance floor, cables… Everything had to be decided beforehand and transported, too. Regardless of the extensive and partially nerve wracking planning we would do it exactly like this again. DE: Uns haben so viele Fragen nach unserer Hochzeitslocation erreicht, was ich euch natürlich nicht vorenthalten möchte. Die Location befindet sich direkt in Palma am Hafen. Wir haben uns so viele tolle Orte auf der Insel angeschaut, wobei wir von Anfang an auch bestimmte Vorstellungen und Erwartungen an die Location hatten: Die Trauung sollte mit Meerblick stattfinden, die Hochzeit selbst an einem Ort umgesetzt werden können und das Allerwichtigste, dass wir unter freiem Himmel so ausgelassen und laut feiern können, wie wir es möchten. Leider ist es auf Mallorca inzwischen so, dass Feiern und Partys nach 24 Uhr in geschlossenen Räumen fortgesetzt werden müssen. Unsere Location, das Castillo de San Carlos, bei dem es sich eigentlich um ein Militärmuseum handelt, hat keine unmittelbaren Nachbarn und eignet sich daher ideal für eine Hochzeitsgesellschaft. Jedoch muss auch erwähnt werden, dass der Aufwand relativ groß bei dieser Location ist, da diese quasi „nackt“ ist und mit allem versorgt werden muss. Stühle, Tische, Deko, Licht, Tanzboden, Stromkabel… alles musste im Vorfeld entschieden und transportiert werden. Trotz der umfangreichen und zum Teil sehr nervenaufreibenden Planung würden wir es exakt noch einmal so machen. ENG: On Friday we hosted a little get together, where our wedding guests could meet and get to know each other. 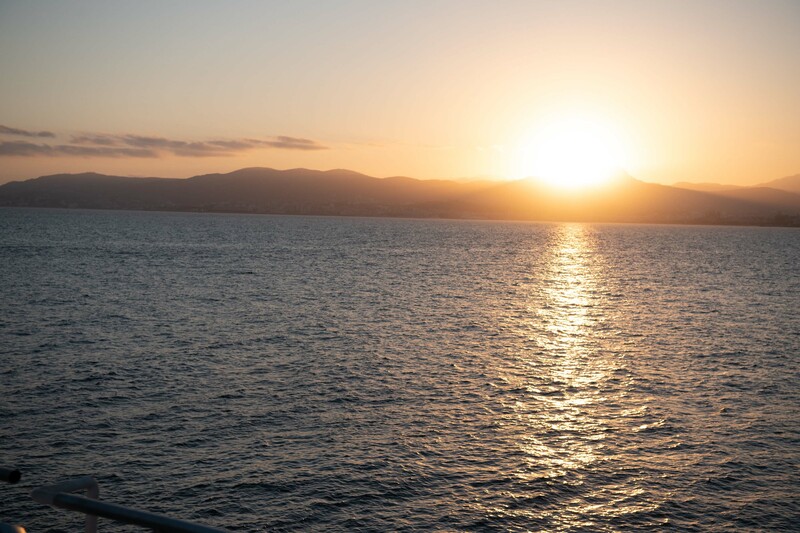 We decided to host this event at the Puro Beach Club in Palma, which does not only offer an exclusive rooftop, but the location is wonderful and offers a beautiful sunset. I am big fan of the clean design of the Puro, everything is white and also the Canapea are truly delicious. 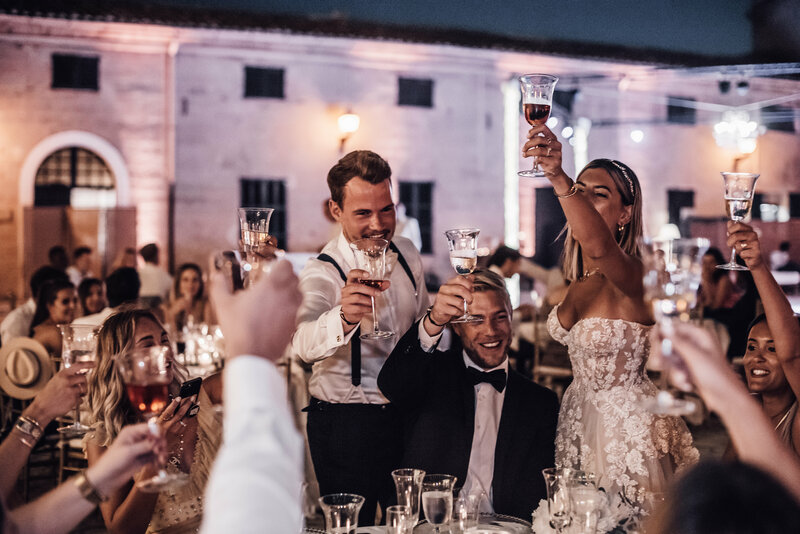 We can only recommend a pre-event, since the atmosphere is relaxed and you have even more time to spend with your guests; and they are able to get to know each other even before the wedding. DE: Am Freitag gab es ein kleines get together, bei dem sich die Hochzeitsgesellschaft schon einmal kennenlernen konnte. Wir haben uns entschieden dieses Event im Puro Beach Club Palma zu organisieren, das nicht nur eine exklusive Dachterrasse zum Feiern bereithält, sondern auch von der Lage her einen wunderschönen Sonnenuntergang bietet. Ich bin ein großes Befürworter des cleanen Designs des Puro, alles ist in Weiß gehalten und auch die Canapes sind ein wahrer Festschmaus. Wir können euch ein Pre-Event wirklich nur ans Herz legen, da die Stimmung ausgelassen ist, ihr mehr Zeit mit und für eure Gäste habt und sich viele bei der eigentlichen Hochzeit schon kennengelernt haben. ENG: I am still speechless that I was able to wear the beautiful Dior dress at the pre event. I think that Dior always creates the most beautiful ‘Ready to wear collection’ and is always on point. That I was able to slip into an Haute Couture dress by Dior for my special occasion fills me with pride and pure happiness. DE: Ich bin noch immer sprachlos, dass ich bei unserem Pre-Event ein wunderschönes Dior Kleid tragen durfte. Für mich persönlich macht Dior die schönste „Ready to wear collection“ und ist dabei immer auf den Punkt. Dass ich zu diesem ganz besonderen Anlass das erste Mal in ein Haute Couture Kleid von Dior schlüpfen durfte, erfüllt mich mit großem Stolz und purer Freude. ENG: What can I say? The endless search in countless bridal boutiques never ended with me finding a dress. Honestly saying I had a completely different dress in mind beforehand, but oftentimes THE ONE is just a different kind. 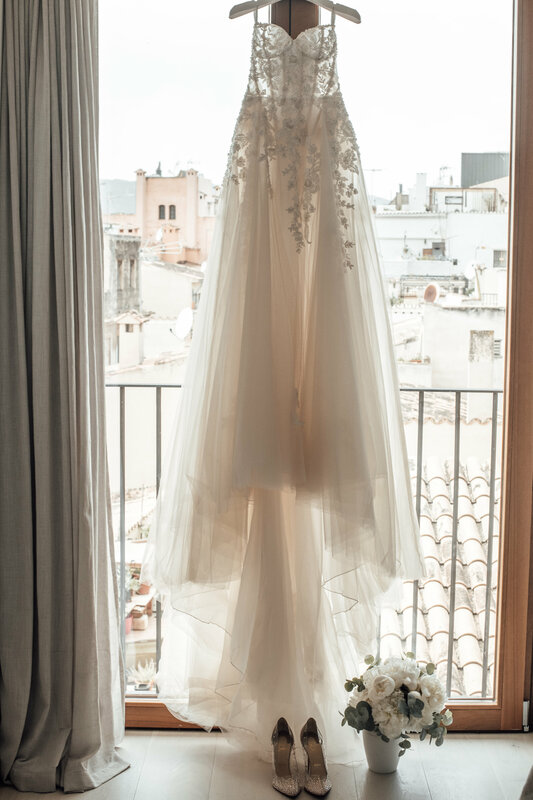 I found my perfect dream dress at the bridal boutique of Galia Lahav in Hamburg. I took my mom and my best men to the first trial and when I got out of the dressing room, we all had tears in our eyes. There it was, the magical moments that so many brides speak of. It was decided right there and then, that this was the dress for me. DE: Was soll ich sagen? Endloses Suchen in zig verschiedenen Boutiquen und Städten, nie habe ich das EINE Kleid gefunden. Ehrlich gesagt hatte ich auch eine ganz andere Vorstellung meines Brautkleides aber wie es oftmals so ist, kommt es am Ende ganz anders. Ich habe mein Traumkleid in Hamburg in der wunderschönen Galia Lahav Boutique gefunden. Bei der ersten Anprobe waren meine Mama und die beiden Trauzeugen dabei, als ich aus der Umkleidekabine kam, schossen uns allen direkt die Tränen in die Augen. Da war er also, dieser eine magische Moment, von dem so viele Bräute sprechen. Natürlich stand sofort fest, dass es dieses Kleid werden sollte. ENG: I obviously liked my party dress just as much as the wedding dress. I am so thankful, that the dear team of Iam Yours made this dress possible I felt so comfortable in it, the cut, colour and the way it fit were just so wonderful, that I would love to post pictures of it every day – but I don’t want to bore you either. ;-) The dreamy dress is from the Australian label ‘Chosen by one day’ and can be bought at ‘Iam Yours’. DE: Offensichtlich hat euch mein Partykleid genauso gut gefallen, wie mir. Ich bin so unendlich dankbar, dass das liebe Team von Iam Yours mir dieses Kleid noch ermöglichen konnte. Ich habe mich unfassbar wohl darin gefühlt, der Schnitt, die Farbe aber auch die Passform haben es mir derart angetan, dass ich am liebsten täglich Bilder damit veröffentlichen würde aber langweilen möchte ich euch natürlich auch nicht. ;-) Das traumhafte Kleid ist übrigens von dem australischen Label „Chosen by one day“ und kann bei „Iam Yours“ ergattert werden. ENG: Our wedding planner Katja had put together a list with all the different catering options for us. Eventually we decided to go with the star-caterer Fosh, who did an amazing job. We had great feedback from our guests and the service, canapes for the aperitif, and the dinner itself were fantastic. 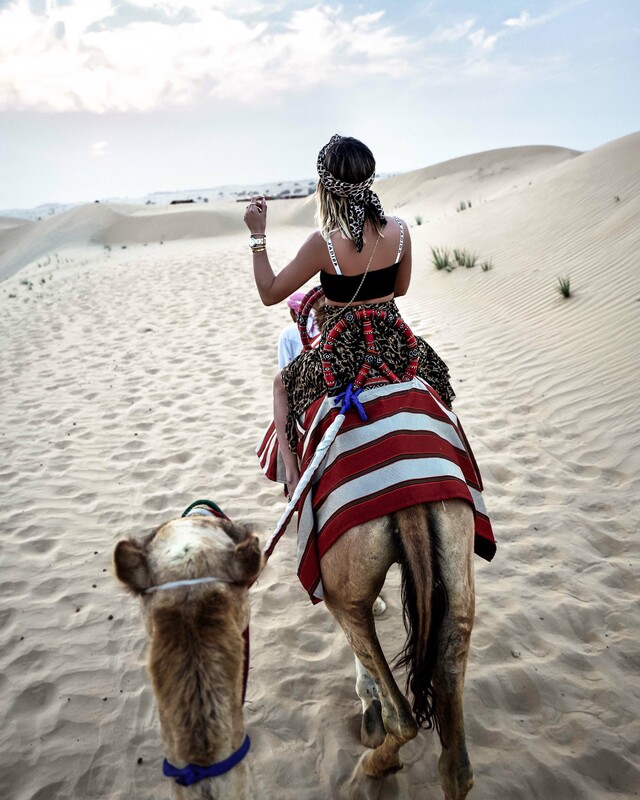 While the starters and the desert were brought to the table, the main course was in form of a buffet, in order to please every guest and give them the chance to choose. We would do it exactly like this again and can only recommend Fosh Catering. DE: Unsere Hochzeitsplanerin Katja hat uns vier verschiedene Catering-Optionen mit unterschiedlichen Angeboten zusammengefasst. Schlussendlich haben wir uns dann für den Sterne-Caterer Fosh entschieden, der einen fabelhaften Job gemacht hat. 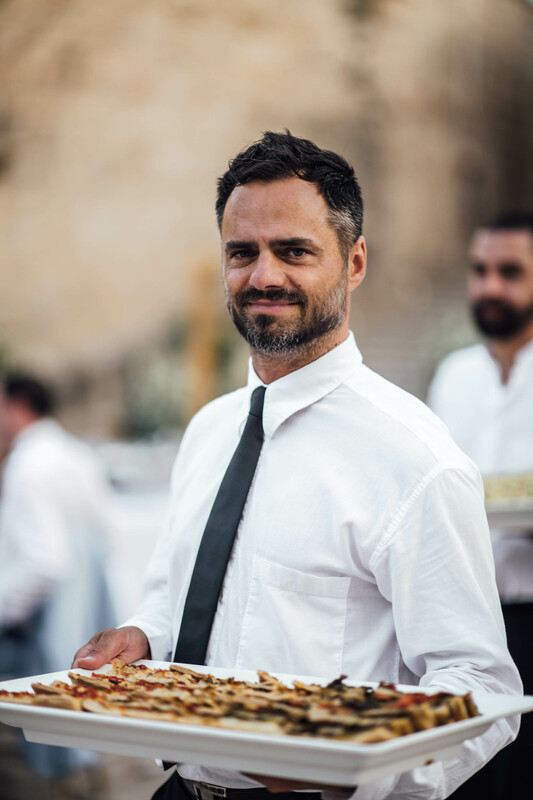 Auch von unseren Hochzeitsgästen haben wir durchweg Positives gehört, der Service, die Canapes zum Aperitif und das Dinner selbst waren einfach fantastisch. Während die Vorspeise und das Dessert am Tisch serviert wurden, gab es den Hauptgang in Buffetform, um wirklich jedem Gast gerecht werden zu können. Wir würden es exakt wieder so machen und können Fosh Catering definitiv empfehlen. ENG: You have no idea how happy I was about our flower decoration. Dear Brigitta from floresmallorca created a masterpiece and exceed our expectations by far. We went with peonies and blue eucalyptus mostly, and then added some beautiful white flowers in the mix. My bridal bouquet and the bridesmaids’ bouquets were only peonies and eucalyptus twigs. DE: Ihr glaubt nicht, wie glücklich ich über unsere Blumendekoration war. Die liebe Brigitta von floresmallorca hat ein Meisterwerk abgeliefert und unsere Erwartungen bei weitem übertroffen. Wir haben uns hauptsächlich für weiße Pfingstrosen mit blauem Eukalyptus entschieden, diese wurden dann um weitere, wunderschöne weiße Blumen ergänzt. Auch mein Brautstrauß und der Strauß meiner Brautjungfern bestand lediglich aus weißen Pfingstrosen und Eukalyptus-Zweigen. ENG: As you have probably seen on Instagram, the dear Tali took our wedding photos and I couldn’t be happier about it. She has so much talent to catch the right moments and put them in the perfect spotlight, which is why I have been posting so many of her photos lately. We are great fans of the atmosphere in her pictures and look at the photos almost daily still. Wedding pictures especially can seem really cheesy fast, but Tali has the perfect strategy and angle and is therefore in my opinion the perfect wedding photographer. 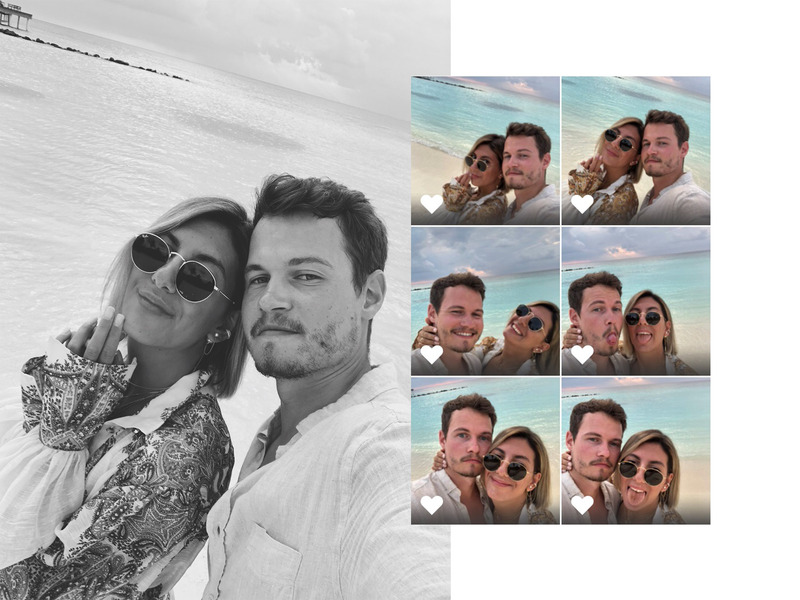 DE: Wie ihr auf Instagram sicherlich mitbekommen habt, hat die liebe Tali unsere Hochzeitsbilder geschossen und wir könnten nicht glücklicher sein. 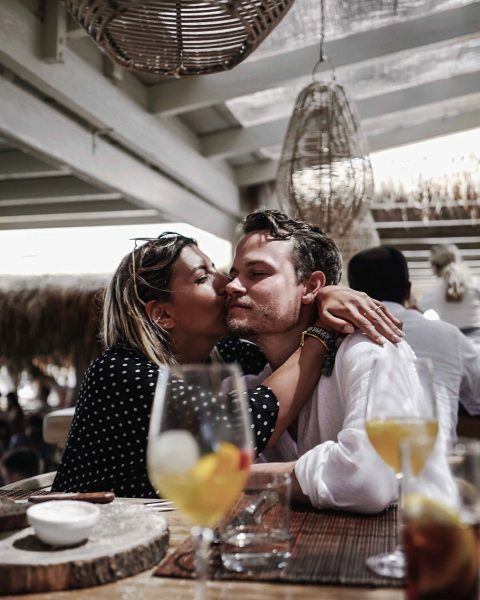 Nicht umsonst habe ich so viele Hochzeitsbilder von ihr auf Instagram veröffentlicht, sie hat einfach das Talent die richtigen Momente einzufangen und diese perfekt in Szene zu setzen. Wir sind große Fans ihrer Bildsprache und schauen uns noch immer beinahe täglich ihre Bilder an. Vor allem Hochzeitsbilder können schnell kitschig wirken aber Tali hat wirklich den perfekten Dreh raus und ist meiner Meinung nach die ideale Hochzeitsfotografin. ENG: Besides Tali we are also incredibly happy that Patrick was by our side and filmed the entire day for us. He has sent us some great snippets already, and we start crying every time, since so many moments were incredibly special and emotional. As soon as we have a social media version of our wedding, we will publish it of course and I am so excited to see the finished video already. DE: Neben Tali sind wir auch super glücklich, dass Patrick an unserer Seite war, der den gesamten Tag für uns filmte. Wir haben schon tolle Ausschnitte von ihm zugeschickt bekommen und jedes Mal fangen wir erneut an zu weinen, da so viele Momente für uns einfach sehr besonders und emotional waren. Sobald wir eine Social-Media-Version unserer Hochzeit haben, werden wir diese natürlich veröffentlichen und ich freue mich schon jetzt so sehr auf das Video. ENG: Jo Laureys has one of the best voices I’ve ever heard in my life! We are so grateful, that one of my reader has recommended Jo as suited wedding singer and the moments during the ceremony were just amazing. You just have to follow him – I’m sure, that we will hear a lot from him in the future. As first song we decided for Ed Sheeran’s ‚Perfect due to Jo’s incredible guitar skills. 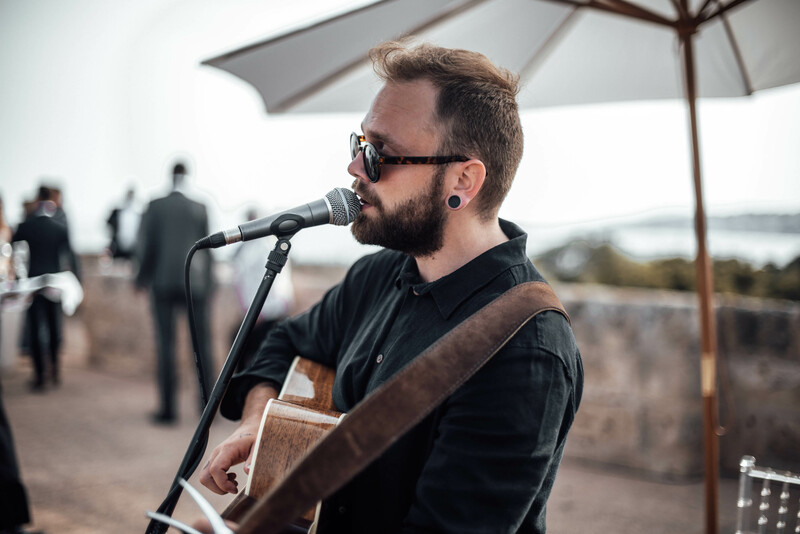 During the ceremony he has played ‚All of me‘ from John Legend, ‚Stand by me‘ and ‚I am Yours‘, he could sing all of them with such a feeling and emotion, that I had tears in my eyes the whole time. DE: Jo Laureys gehört zu einer der schönsten Stimmen, die ich seit Ewigkeiten live hören durfte! Wir sind so unendlich dankbar, dass uns eine Leserin Jo empfohlen hat und uns die schönsten Momente während der Trauung beschert hat. Ihr müsst ihm unbedingt folgen – ich bin mir sicher, dass wir in Zukunft noch ganz viel von ihm hören werden. Als Einlauflied hat er „Perfect von Ed Sheeran“ mit seiner Gitarre gespielt. Während der Zeremonie haben wir uns noch für „All of me von John Legend“, „Stand by Me von Ben E. King“ & „I am Yours von Jason Mraz“ entschieden und diese Lieder hat er ebenfalls wahnsinnig gut performed. 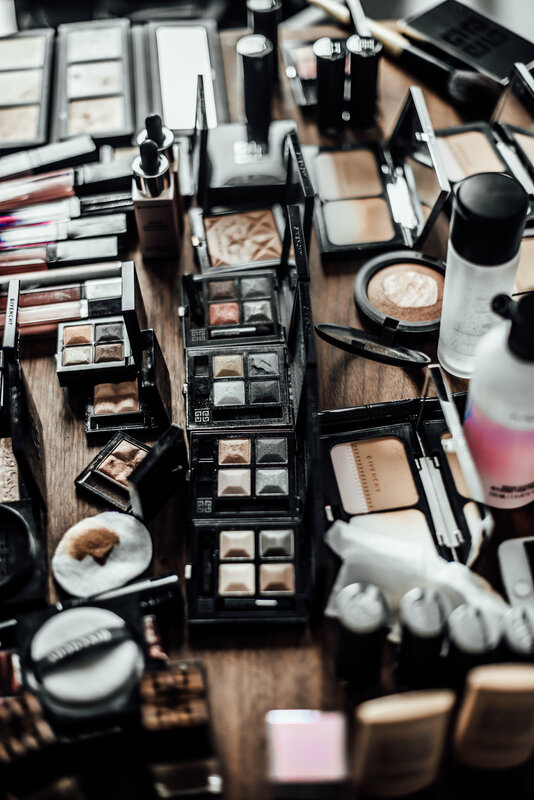 ENG: Luckily Givenchy Beauty was part of my big day and Nevil, the national makeup artist was flown to Mallorca. Nevil did an amazing job too, and took care of our mothers, my bridesmaids and me and made this wonderful day even more beautiful. So many questions came up regarding my lipstick and I want to give the official name of it again here: the colour number is ‘317’ corail signature. I love the colour on tanned skin – a dream! DE: Glücklicherweise hat mich Givenchy Beauty an meinem großen Tag begleitet und Nevil, den National Make-Up Artist, einfliegen lassen. Auch Nevil hat wirklich grandiose Arbeit geleistet und sowohl unsere Mütter, meine Brautjungfern als auch mich für diesen besonderen Tag verschönert. Da so unendlich viele Fragen nach meinem orangenen Lippenstift aufkamen, möchte ich euch hier nochmal die offizielle Bezeichnung geben: Es handelt sich um die Farbnummer „317“ corail signature. Ich liebe die Farbe auf gebräunter Haut – ein Traum! 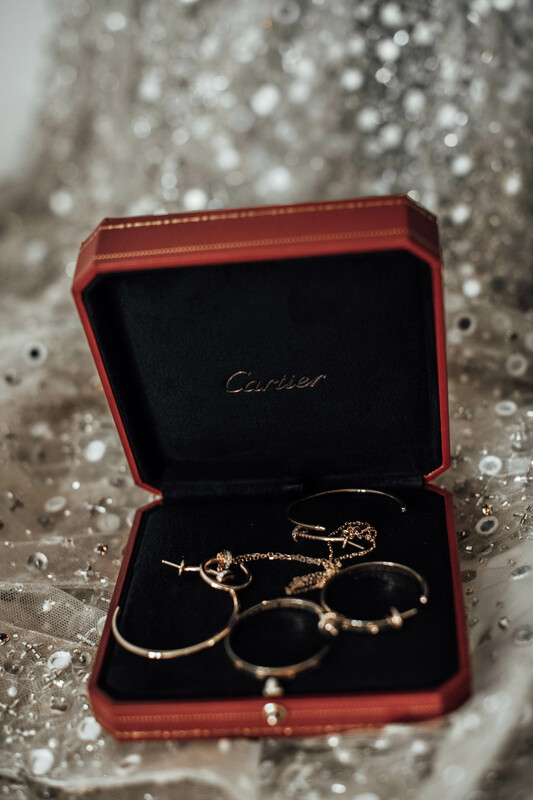 ENG: At this point I would like to thank Cartier again, who lend me some beautiful pieces for the wedding. 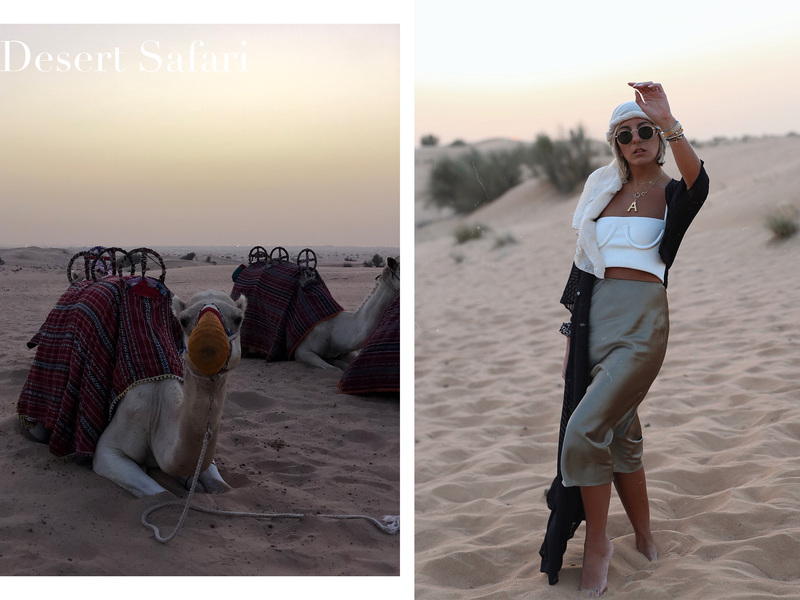 In the luxury segment, Cartier is definitely my number one, which is why I am so thankful for their support. 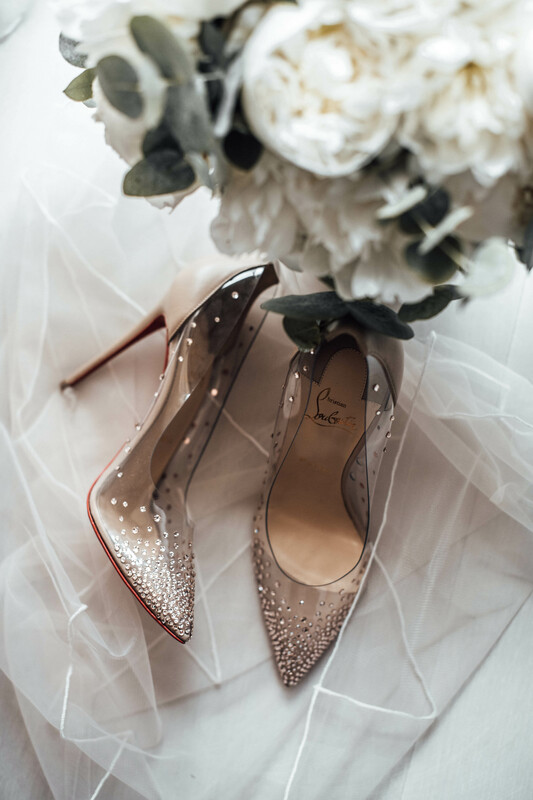 Another big thank you to Christian Louboutin, who definitely made my Cinderella-moment happen. DE: An dieser Stelle möchte ich auch noch einmal ein riesiges Dankeschön an Cartier sagen, die mir zauberhafte Schmuckstücke für die Hochzeit geliehen haben. Im hochpreisigen Schmuck Segment ist Cartier für mich die absolute Nummer 1, weshalb ich für die Unterstützung auch unendlich dankbar bin. Zudem gilt ein großes Dankeschön dem Team von Christian Louboutin, die mir meinen Cinderella-Moment definitiv erfüllt haben. 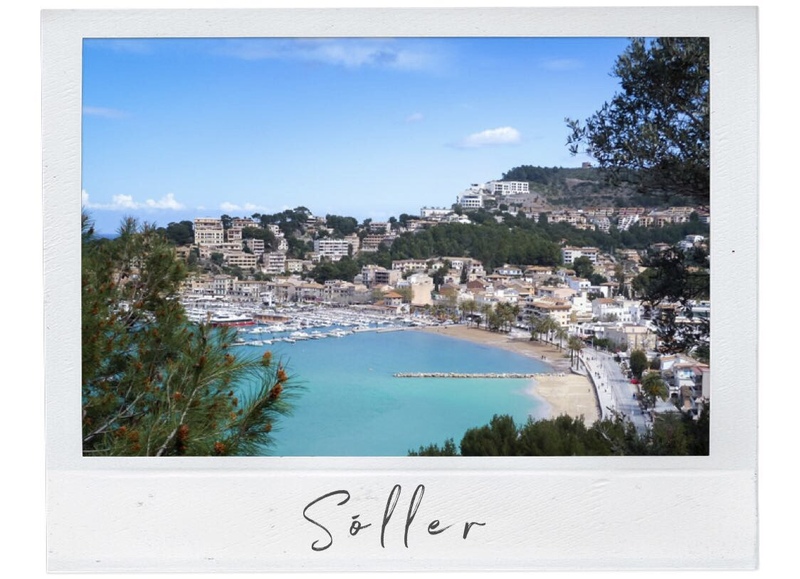 ENG: Even though we have been to Mallorca, especially in Palma more times than here – our hearts are secretly beating for Ibiza. It is hard to explain, but the atmosphere on the island and the ‘spirit’ are something very special to us. We have been on the island in the summer of 2017 already, and have published an article about our experiences back then. 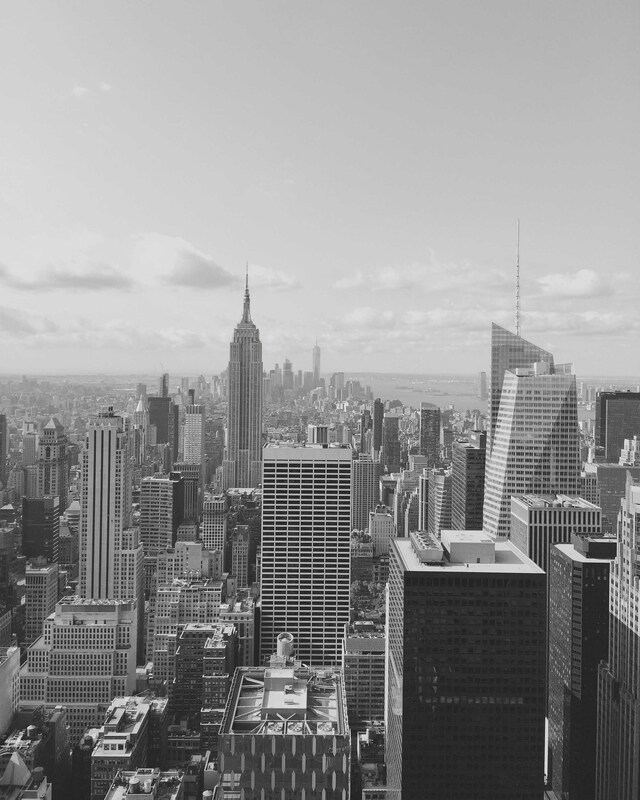 Today I would like to share my personal ‘Top 13’ of recommendations and insider-tips, which we just loved. One more thing: Ibiza is known worldwide for its wild parties and known DJs that play in the large and famous clubs. 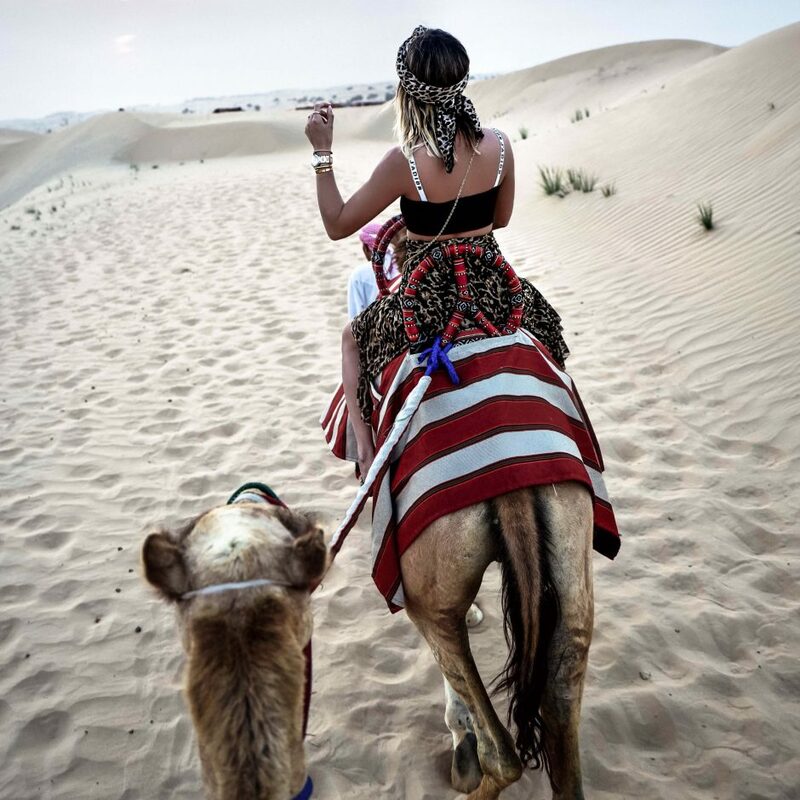 But instead of partying, we chose to have a relaxed holiday with friends and want to show you some beach clubs, restaurants and excursions, which are all things we have seen and enjoyed. DE: Auch wenn wir bislang häufiger auf Mallorca bzw. in Palma waren, schlägt unser Herz doch eigentlich stärker für Ibiza. Es ist schwierig zu beschreiben aber die Atmosphäre auf dieser Insel und der ‚Spirit’ sind für uns etwas ganz Besonderes. Wir waren bereits im Sommer 2017 auf Ibiza und haben damals einen Beitrag über unsere Erfahrungen veröffentlicht. Heute möchte ich euch gerne meine persönlichen ‚Top 13’ mit Empfehlungen und Insider-Tipps vorstellen, die es uns sehr angetan haben. Eines vorab: Ibiza ist sehr bekannt für Partys und weltberühmte DJs, die regelmäßig in den großen Clubs der Insel auflegen. 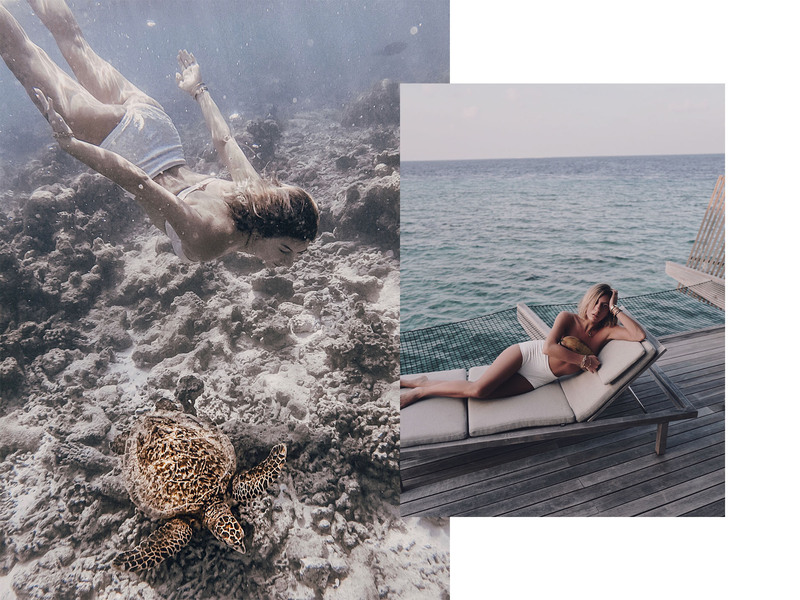 Wir haben stattdessen einen entspannten Urlaub mit Freunden gemacht und wollen euch daher eher Beach Clubs, Restaurants und Ausflugstipps geben, die sich natürlich nur auf das beziehen, was wir selbst erlebt haben. ENG: The ‘La Brasa’ is in Eivissa, the old town of the island. It is a spanish restaurant with a huge wine selection and an idyllic backyard, which makes you want to stay all night. You should definitely make a reservation ahead of time, because the restaurant is popular amongst locals and tourists. Also, the cost-performance ratio is absolutely fair and conclusive. DE: Das ‚La Brasa’ befindet sich in Eivissa, der Altstadt von Ibiza. Es handelt sich um ein spanisches Restaurant mit einer großen Weinkarte und einem idyllischen Hinterhof, sodass man hier am liebsten die ganze Nacht verweilen möchte. Ihr solltet unbedingt vorab reservieren, da das Restaurant sowohl bei Einheimischen, als auch bei Touristen sehr beliebt ist. Zudem ist das Preis-Leistungs-Verhältnis wirklich fair und überzeugend. ENG: We went to ‘La Oliva’ twice. 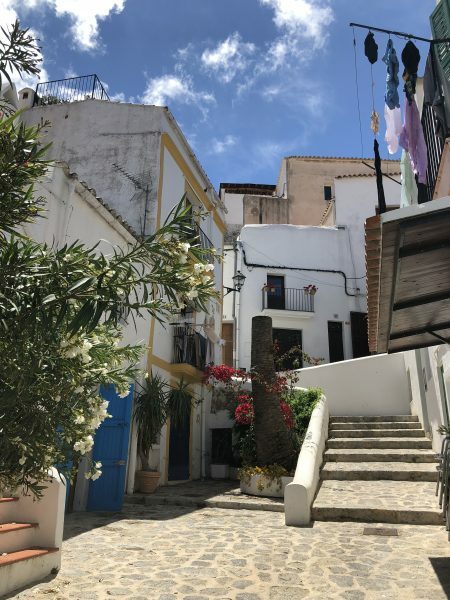 The small restaurant is also located in the old town, and more specifically in a small alley that leads up to the cathedral and the fort at the upper end of the city Ibiza. 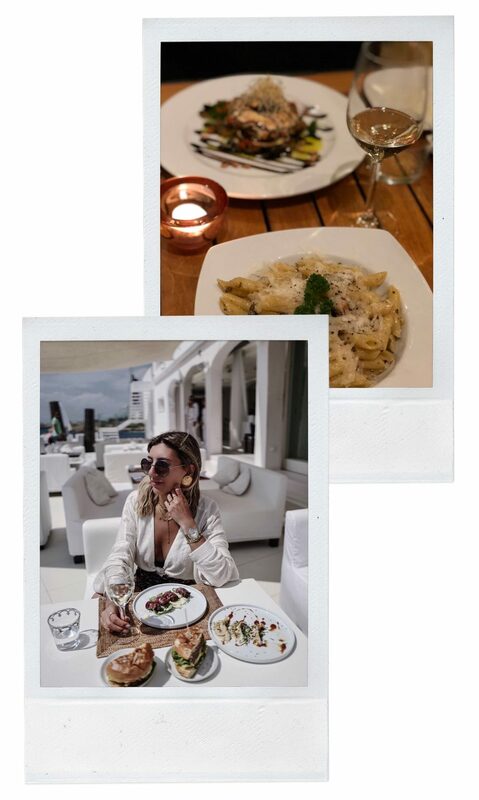 The restaurant is rather understated, but has so much charme due to it’s outdoor area and the surrounding boutiques. The menu isn’t as big as the one from ‘La Brasa’, but still anyone will find something here. Anyone who likes to be surrounded by people and wants fun while eating – this is the place for you. DE: Wir waren gleich zweimal im ‚La Oliva’. Dieses kleine Restaurant befindet sich ebenfalls in der Altstadt, genauer gesagt in einer der schmalen Gassen, die hoch zur Kathedrale und Festungsanlage am oberen Ende von Ibiza-Stadt führen. Das Restaurant ist eher unauffällig aber hat durch den Außenbereich und die umliegenden Boutiquen einen ganz besonderen Charme. Die Karte ist nicht so groß, wie die vom ‚La Brasa’, trotzdem ist hier für jeden Geschmack etwas dabei. Wer sich gerne mit Menschen umgibt und Spaß beim Essen haben möchte, kommt hier definitiv auf seine Kosten. ENG: The ‘Izakaya’ is located within the Sir Joan Hotel and in walking distance to the harbor. It is a modern, asian restaurant with numerous sushi-creations and south american influences. 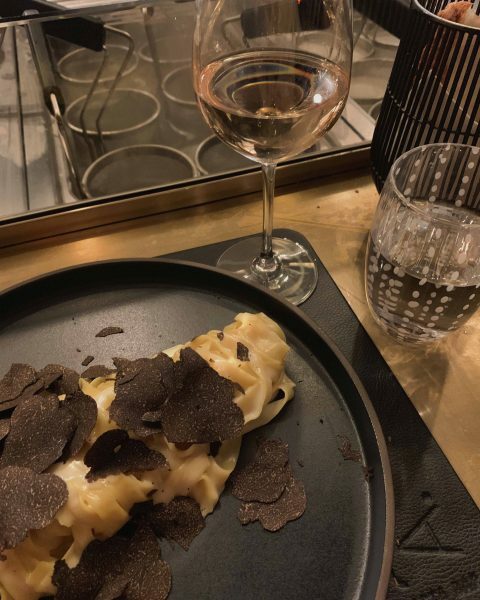 The service is amazing and the quality incredible, and it is so much fun to try everything on the menu and get to know completely new taste experiences. The Izakaya is currently not only in Ibiza, but also in Hamburg, Munich and Amsterdam. 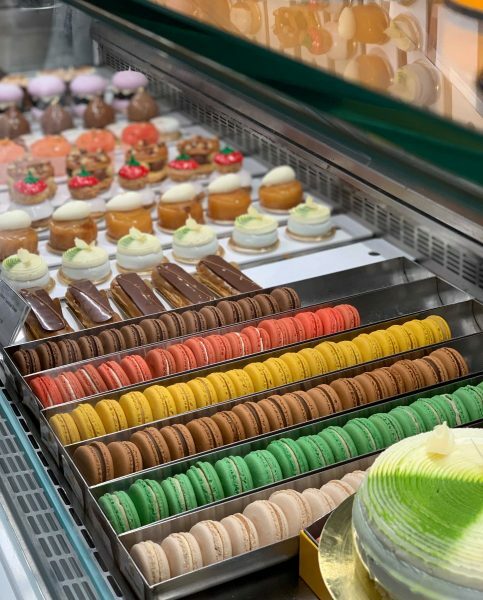 Even if it’s a little expensive, the gourmets should definitely pay this place a visit: It is worth it! DE: Das ‚Izakaya’ befindet sich im Sir Joan Hotel in fußläufiger Entfernung zum Hafen. Es handelt sich um ein modernes, asiatisches Restaurant mit diversen Sushi-Kreationen und südamerikanischen Einflüssen. Der Service ist großartig und die Qualität einmalig, es macht einfach nur Spaß sich durch die Speisekarte zu probieren und neue Geschmackserlebnisse kennenzulernen. Das Izakaya gibt es derzeit nicht nur auf Ibiza, sondern auch in Hamburg, München und Amsterdam. Auch wenn es ein bisschen teurer ist, sollten die Feinschmecker unter euch definitiv mal vorbeischauen: Es lohnt sich! ENG: I think the ‘La Paloma’ is an absolute top secret tip. Located in the middle of the island in a small village, with dreamy surroundings filled with lemon trees and mediterranean gardens, you can enjoy home-cooked meals and dive into the relaxed atmosphere. DE: Das ‚La Paloma’ ist meiner Meinung nach einer absoluter Geheimtipp. Auf der Mitte der Insel in einem kleinen Dorf gelegen, könnt ihr in einer traumhaften Kulisse aus Zitronenbäumen und dem mediterranen Garten die selbstgemachten Speisen testen und euch der entspannten Atmosphäre hingeben. ENG: Overall there are six of the so-called ‘Passion Cafés’. 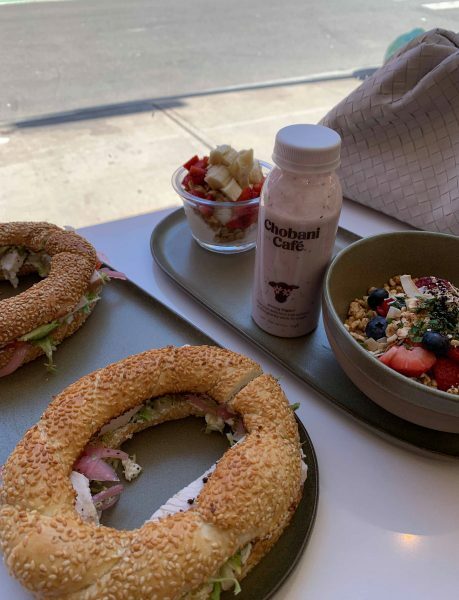 If you are breakfast lovers you will definitely not be disappointed here. From shakes to smoothies, pancakes and bowls you can enjoy everything here to start your day happily after a long night of parties. DE: Es gibt auf Ibiza insgesamt sechs der so genannten ‚Passion Cafés’. Wenn ihr Frühstücksliebhaber seid, egal ob vegan, vegetarisch oder klassisch, hier werdet ihr definitiv nicht enttäuscht. Von Shakes, über Smoothies, Pancakes und Bowls bekommt ihr hier alles, um einer langen Partynacht zu trotzen und gut gelaunt in den Tag zu starten. ENG: This Beachclub is the perfect location for a morning by the beach. In the morning you can have a relaxed breakfast in the lounge area, and move to a lounge afterwords or a daybed by the beach, where you can just soak in the sun. There’s not only fresh Sangria for lunch, but also iberian ham and ailoli, while the live DJ plays tunes, and you can enjoy the mediterranean flair in the restaurant area of the beach club fully. 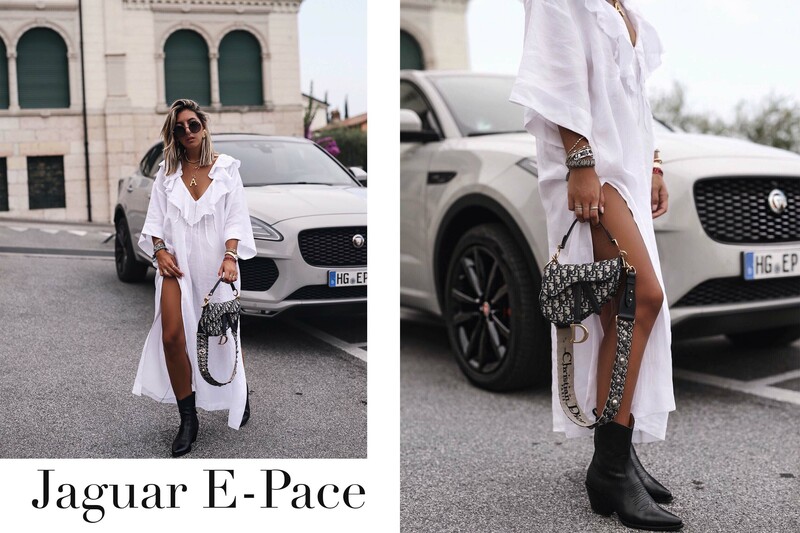 In addition to that there are sales ladies by the beach that present light summer dresses and swimwear – you will find everything you need here. DE: Dieser Beachclub ist der perfekte Ort für einen Tag am Strand. Morgens könnt ihr im Lounge-Bereich entspannt frühstücken, anschließend geht es auf die Liege oder ein Tagesbett zum Sonnenbaden am Strand. Zum Lunch gibt es nicht nur frischen Sangria, iberischen Schinken und Aioli, sondern auch einen Live DJ, um das mediterrane Flair im Restaurant des Beachclubs komplett zu genießen. Zudem gibt es am Strand Verkäuferinnen, die leichte Sommerkleider und Bademode präsentieren. Hier wird einfach alles geboten, was das Urlaubsherz begehrt. ENG: The ‘Experimental Beachclub’ convinces with its beautiful lounge area and the panoramic view. You can reach the water through a specific spot and there is no immediate connection from the beach to the water. Still, there is a special flair, and you can have your food and drink orders brought to the sun lounges and shop the Ibiza-typical sundresses in a separate area alongside the bar. The Experimental Beachclub is smaller than the El Chiringuito, but there is definitely a relaxed atmosphere. 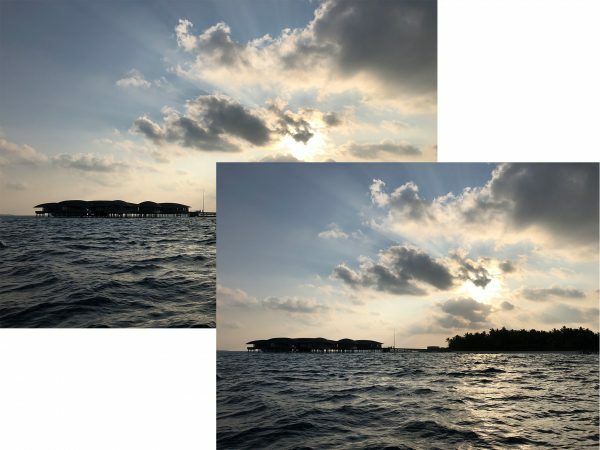 DE: Der ‚Experimental Beachlub’ besticht vor allem durch den optisch ansprechenden Loungebereich und den tollen Panoramablick. Der Zugang zum Wasser erfolgt an einer bestimmten Stelle, es gibt keinen fließenden Übergang vom Sandstrand zum Wasser. Trotzdem herrscht hier ein besonderes Flair, ihr könnt euch kleine Speisen an die Sonnenliegen bringen lassen und entlang der Bar in einem separaten Bereich die Ibiza-typischen Sommerkleider shoppen. 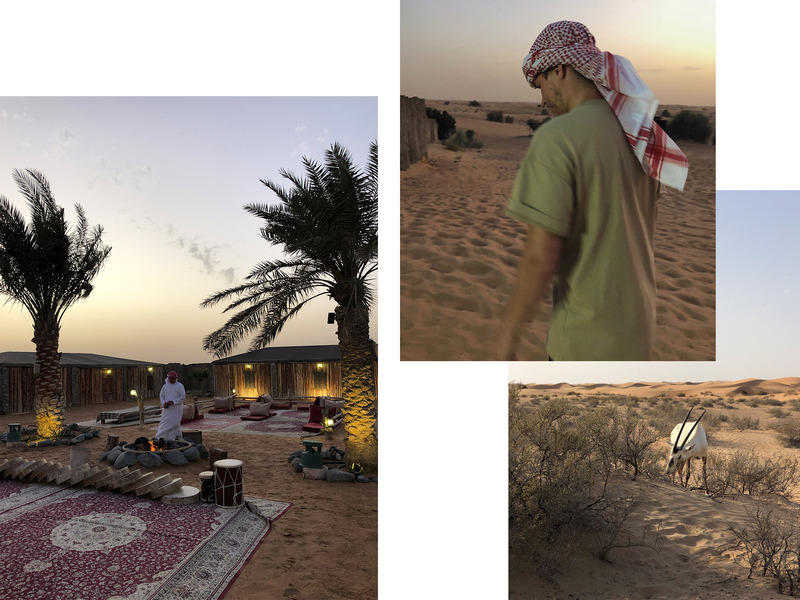 Der Experimental Beachclub ist kleiner, als das El Chiringuito, dafür herrscht hier definitiv eine entspannte und erholsame Atmosphäre. ENG: The ‘Sa Trinxa’ is a beach bar at the beach of Salinas, and doesn’t have its own dance floor. The bar is best described with words such as traditional, relaxed and colorful, there is live music from the DJ and very interesting people. 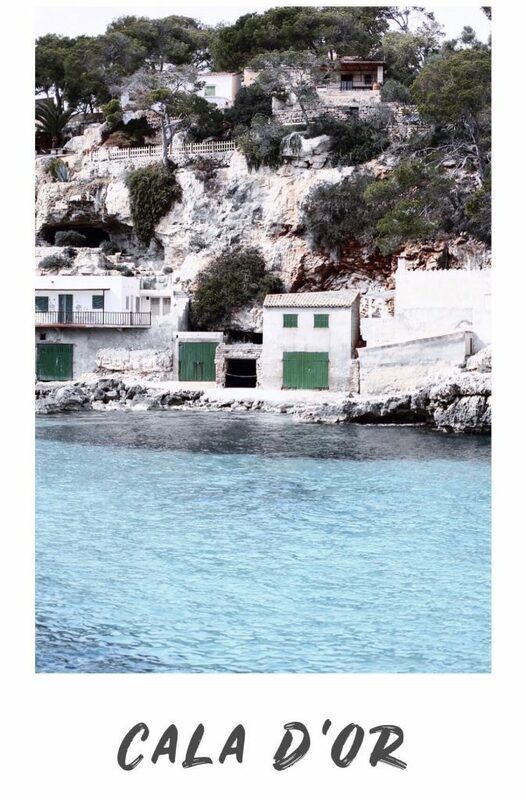 It is less about the luxury, but much more about the character of the island and the typical Ibiza-vibe of the people. 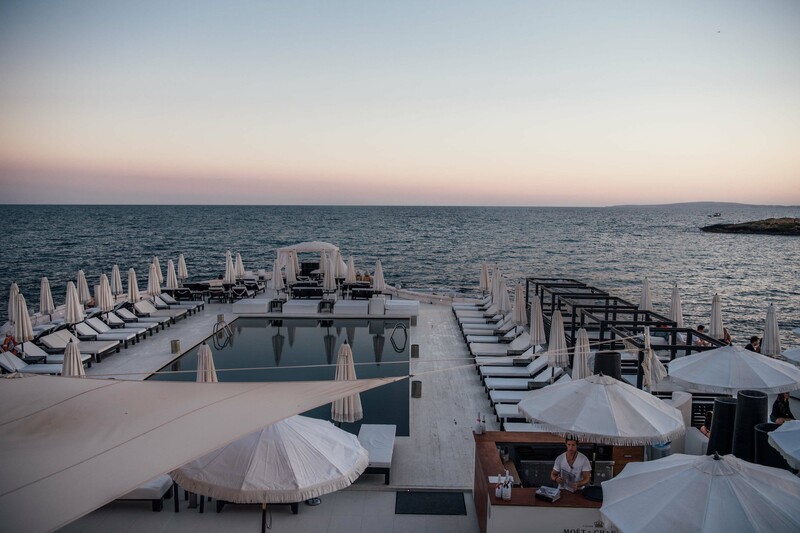 The beach offers sun lounges and there is a huge area to relax, which creates the perfect mix of a modern, minimalist lounge bar and a wide beach. DE: Das ‚Sa Trinxa’ ist eine Beachbar am Strand von Salinas, kein Beachclub mit einer eigenen Tanzfläche. Die Beachbar lässt sich am besten mit den Worten urig, entspannt und farbenfroh beschreiben, es gibt Live-Musik vom DJ und ein sehr interessantes Publikum. Es geht hier weniger um Luxus, als vielmehr um den Charakter und typischen Ibiza-Vibe der Leute. Der Strand selbst bietet Sonnenliegen und einen groß angelegten Bereich zum Entspannen, der perfekte Mix einer modernen, minimalistischen Loungebar und einem weitläufigen Strand. ENG: The Nobu Hotel is a 5-star hotel, which fulfills every wish in terms of service and quality. The bright and modern rooms, a huge pool area, sun lounges by the beach and attentive service make every visitor’s heart beat faster. The hotel definitely isn’t cheap, but you have the perfect service around the clock and can relax perfectly. DE: Das Nobu Hotel ist ein 5 Sterne Hotel, das in Bezug auf Service und Qualität keine Wünsche offen lässt. Helle und moderne Zimmer, eine weitläufige Poolanlage, Sonnenliegen am Strand und ein aufmerksamer Service lassen das Urlaubsherz höher schlagen. Sicherlich ist das Hotel nicht ganz günstig, dafür kommt ihr hier von morgens bis abends komplett auf eure Kosten und könnt euch ideal entspannen. ENG: The ‘Sir Joan’ belongs to the same building complex as the Izakaya. 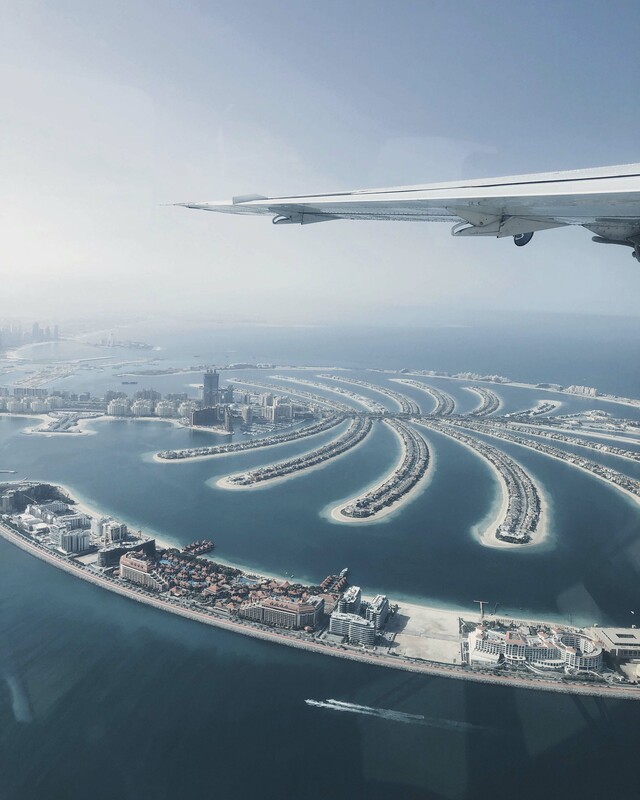 The hotel offers 38 rooms and suits, and has a lot to offer in terms of architecture and interior design. It is a very modern and exclusive hotel, which is in walking distance to one of the most popular clubs on the island, the Pascha, but is also the perfect place to sit back and relax. 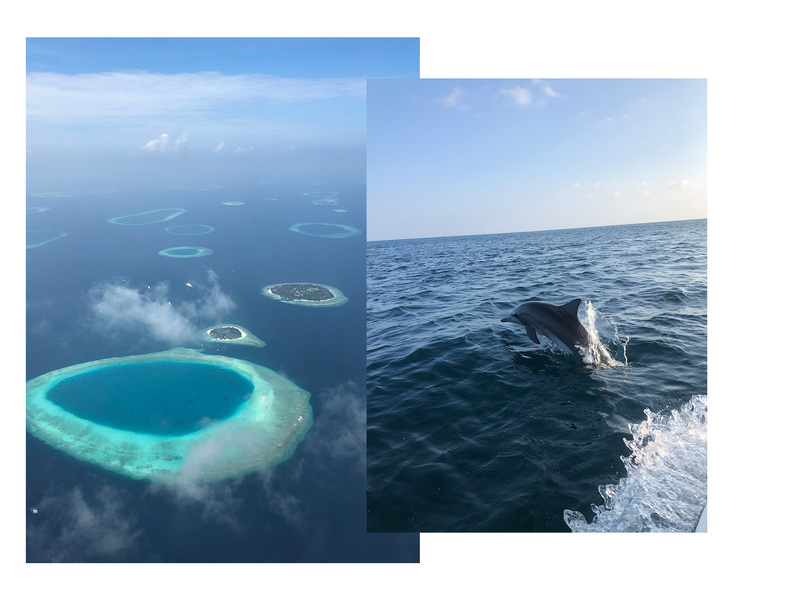 For visitors that are looking to visit all the hotspots of the island, the hotel is in the perfect walking distance to them and the ideal location to connect with cool and modern people. DE: Das ‚Sir Joan’ gehört zu dem gleichen Gebäudekomplex, wie das Izakaya. Das Hotel bietet insgesamt 38 Zimmer und Suiten, in Bezug auf die Architektur und Innenausstattung hat dieses Hotel einiges zu bieten. Es ist ein sehr modernes und exklusives Hotel, das nicht nur fußläufig zu einem der bekanntesten Clubs der Insel gelegen ist, dem Pascha, sondern auch einen idealen Rückzugsort zum Entspannen darstellt. 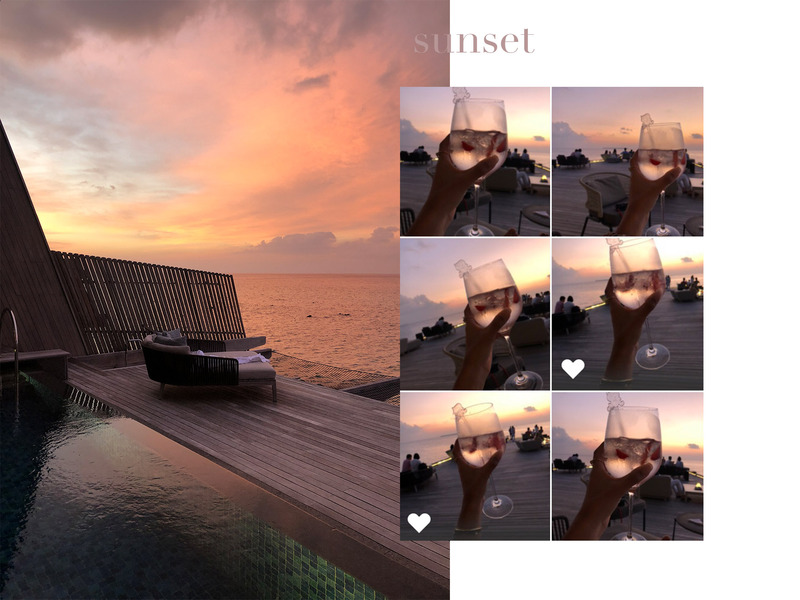 Für unternehmungslustige Inselbesucher ist dieses Hotel die perfekte Adresse, um schnell zu den Hotspots der Insel zu gelangen und sich unter offenen und modernen Leuten zu vernetzen. ENG: Every visit to the island requires a visit to the old town. From the harbor up to the fort there are numerous small alleys with boutiques, cafes and restaurants. Especially from the height of the fort you have a wonderful view of the harbor and the nature of the island. 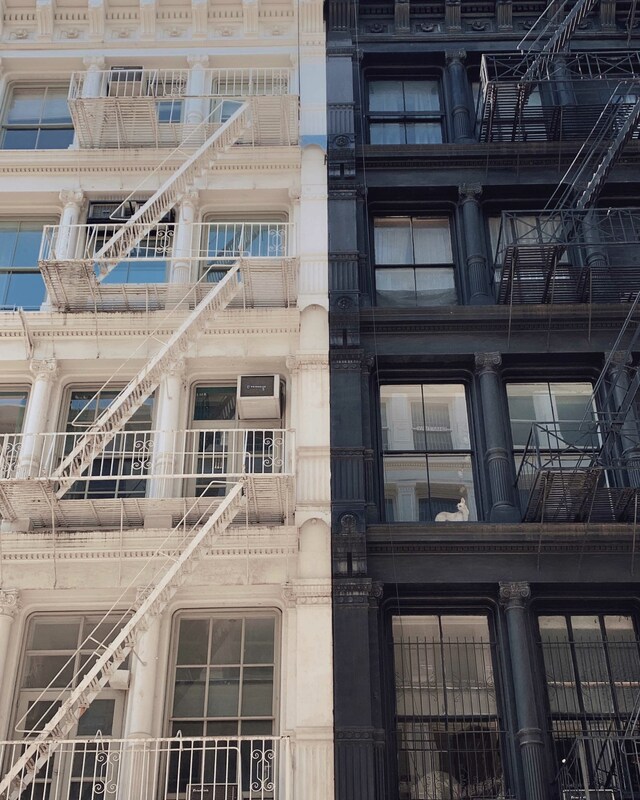 The old town’s maze of alleys offer great locations for photo shoots – and they all lead to the top. In addition to that there are big yachts arriving at the harbor regularly, that you can marvel at while shopping alongside the promenade. DE: Zu jedem Ibizaaufenthalt gehört definitiv ein Besuch der Altstadt. Vom Hafen bis hoch zur Festungsanlage gibt es zahlreiche Gassen mit kleinen Boutiquen, Cafés und Restaurants. Vor allem auf Höhe der Festungsanlage am oberen Ende der Altstadt habt ihr einen traumhaften Blick auf den Hafen und die Natur der Insel. Es gibt mehrere verwinkelte Gassen, die hinaufführen und gleichzeitig tolle Locations zum Fotografieren bieten. Zudem liegen regelmäßig große Yachten im Hafen, die ihr beim Bummeln an der Promenade bestaunen könnt. ENG: Who doesn’t know them the hippies of the 60s and 70s that lived by their motto of ‘enjoying life’. 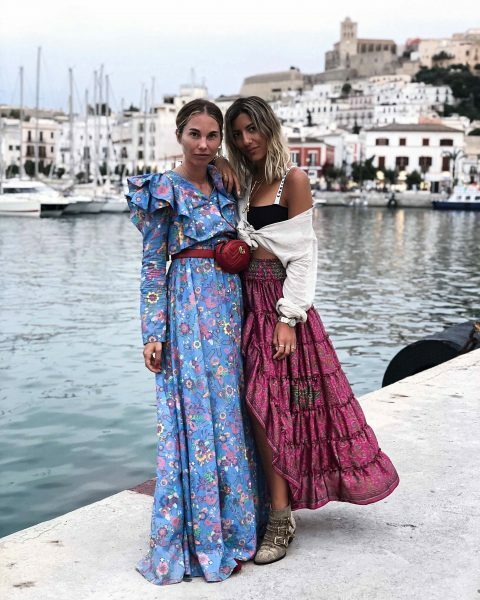 Not only the boutiques in the old town and the sales ladies by the beach, but especially on the island’s hippie market you can really dive into the hippie-culture. There are numerous hippie markets, but our favorite is the so-called ‘Mercadillo-Hippy – Las Dalias’. 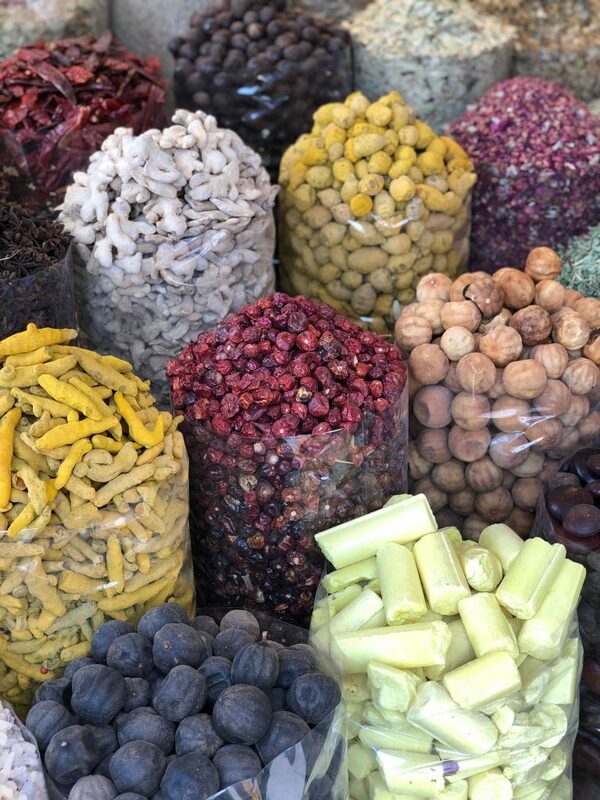 The market takes place all year long on Saturdays, and in the high season even during the week – and as a night market. Many call this market the most authentic hippie-market of the island. DE: Wer kennt sie nicht mehr die Hippies aus den 60er und 70er Jahren, die das Motto ‚das Leben genießen’ noch wörtlich genommen haben. Nicht nur in den Boutiquen der Altstadt oder bei den Verkäuferinnen am Strand, gerade auf den inseleigenen Hippie-Märkten könnt ihr euch der Hippie-Kultur hingeben. Es gibt diverse Hippie-Märkte, wobei unser Favorit der so genannte ‚Mercadillo-Hippy – Las Dalias’ ist. Dieser Markt findet ganzjährig samstags statt, in der Hochsaison findet dieser Markt auch unter der Woche als Nachtmarkt statt. Viele bezeichnen diesen Hippie-Markt als den authentischsten auf der Insel. 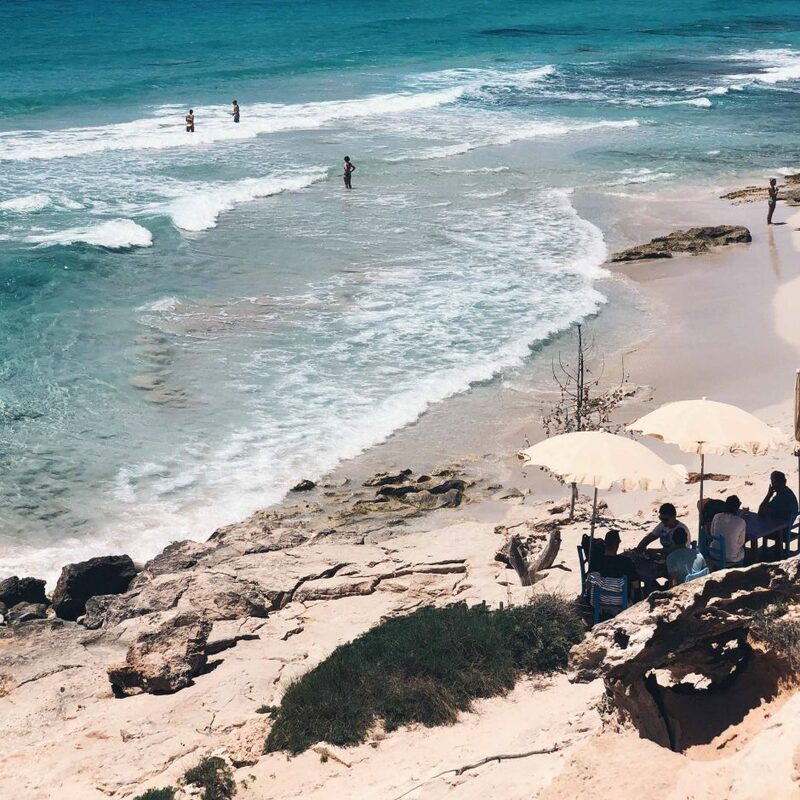 ENG: If you are Mallorca-fans and Ibiza is close to your heart, there is another wonderful place in the Baleares: Formentera. It feels like time has stopped moving on this island, and especially nature-lovers will adore this place. There are hidden bays and dreamy beaches, and you can explore the island with a bike or a taxi, which are really cheap. 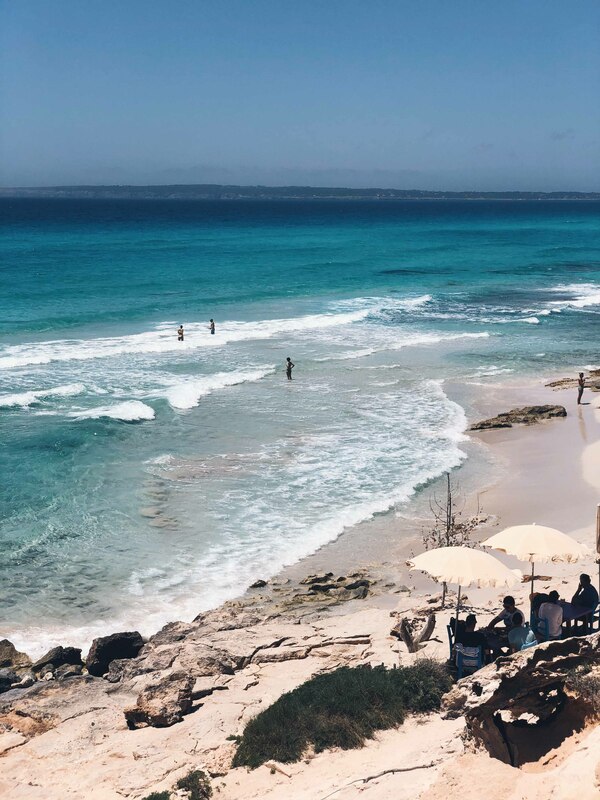 You will not be disappointed by the Formentera-feeling, simply the ferry ride to the island is joyous. DE: Wenn ihr Fans von Mallorca seid und Ibiza in euer Herz geschlossen habt, gibt es auf den Balearen noch eine Steigerung: Formentera. Auf Formentera ist gefühlt die Zeit stehengeblieben, hier kommen vor allem Naturliebhaber auf ihre Kosten. Es gibt versteckte Buchten und traumhafte Sandstrände, ihr könnt mit dem Fahrrad die Insel erkunden oder eines der örtlichen Taxis nutzen, die sehr günstig sind. Formentera ist ein Gefühl, von dem ihr definitiv nicht enttäuscht werdet, allein die Fahrt mit der Fähre zur Insel ist ein einziger Genuss. The look convinces mostly with a cozy Oversized knitted Sweater in light purple by Edited the Label. The jumper doesn’t only keep you warm and protects from the mucky weather, but gives you a perfectly stylish look for the cold time of the year in my eyes. I combined the jumper with a simple pair of grey yeans as well as the chunky Valentino Boots, which are perfect for the weather and winter because of their sole. I then added a Chanel Vintage Bag and the trendy yet practical winter look was done. We will hopefully get the chance to go on another trip to the Alps this winter, as I can’t wait to be back on skis and enjoy the sun while riding down a mountain. Are you winter holiday fans too or do you prefer relaxing on the beach during summer?